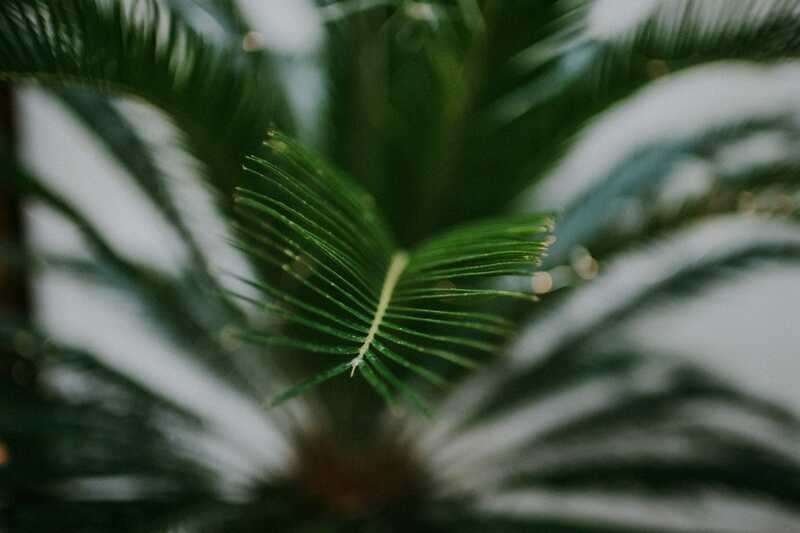 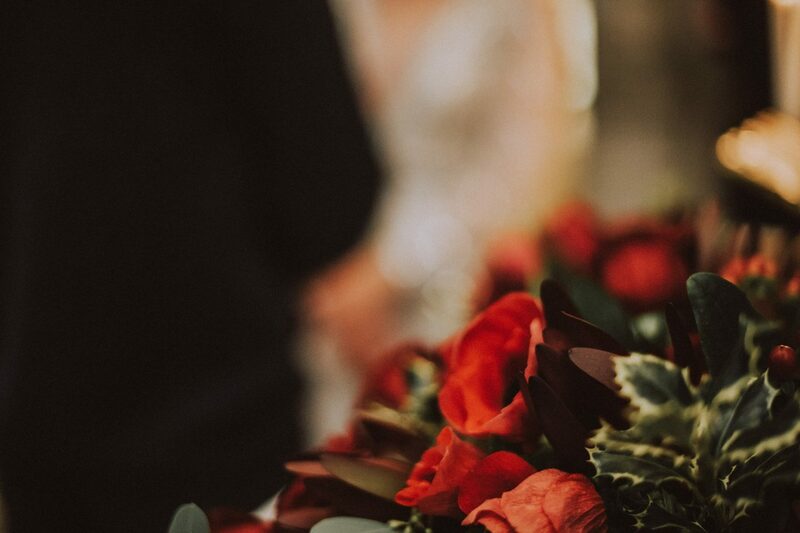 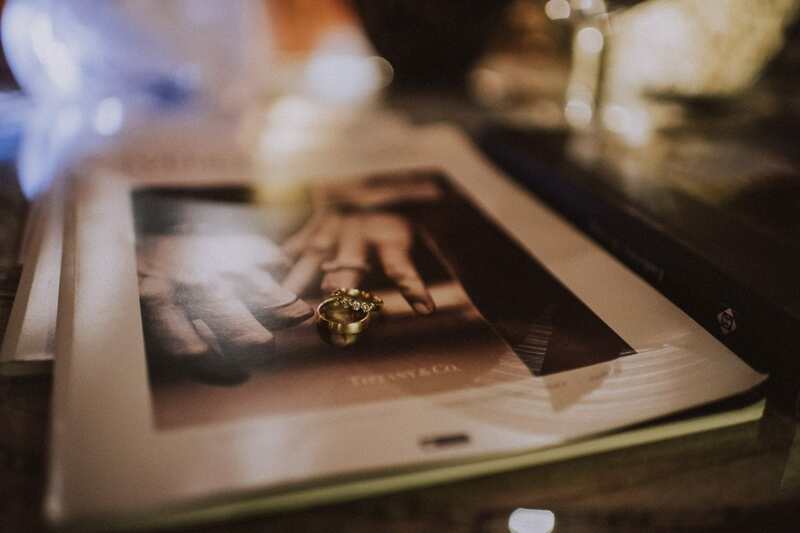 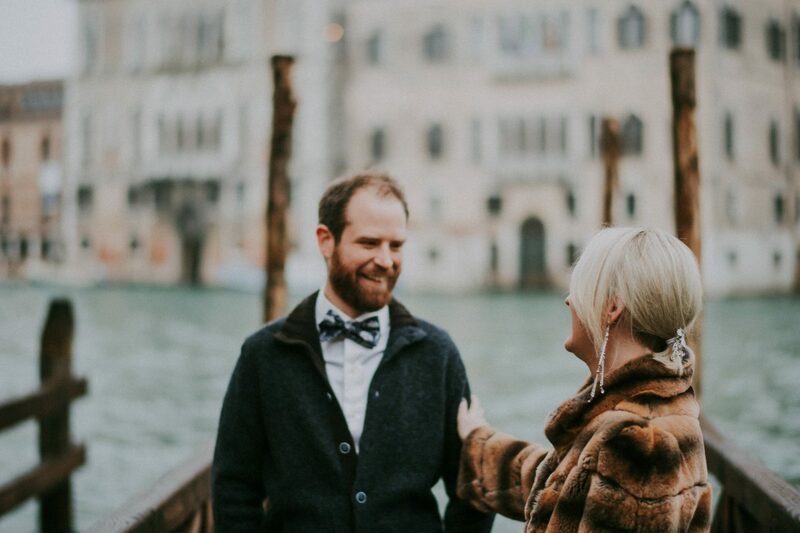 I have kept Whitney and Greg’s destination wedding unpublished by far for some reasons but, since their first anniversary date is getting closer, I think this is the right time to show you their love story! 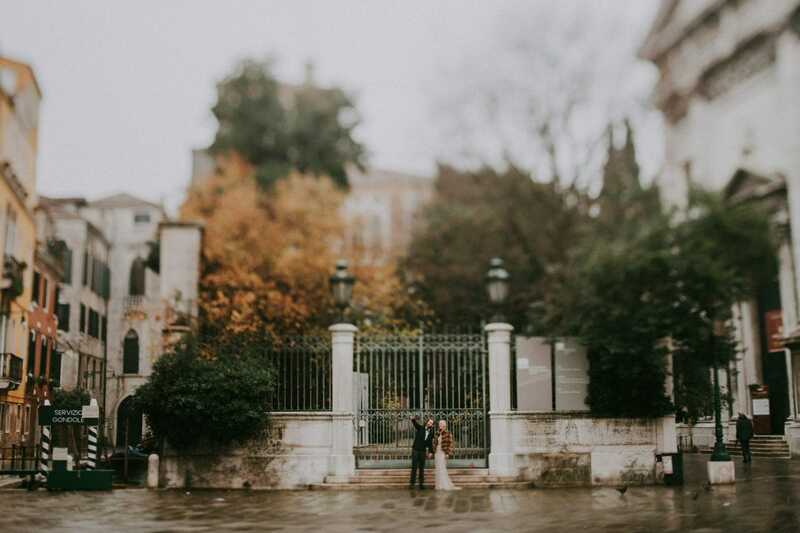 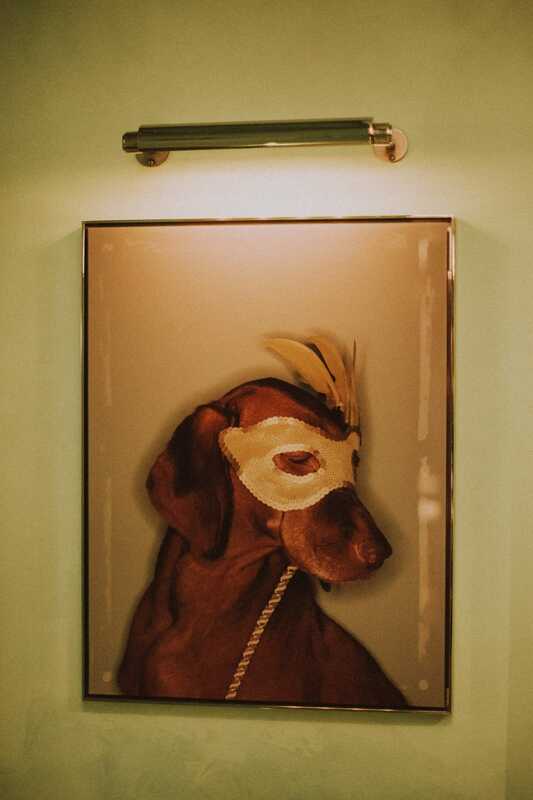 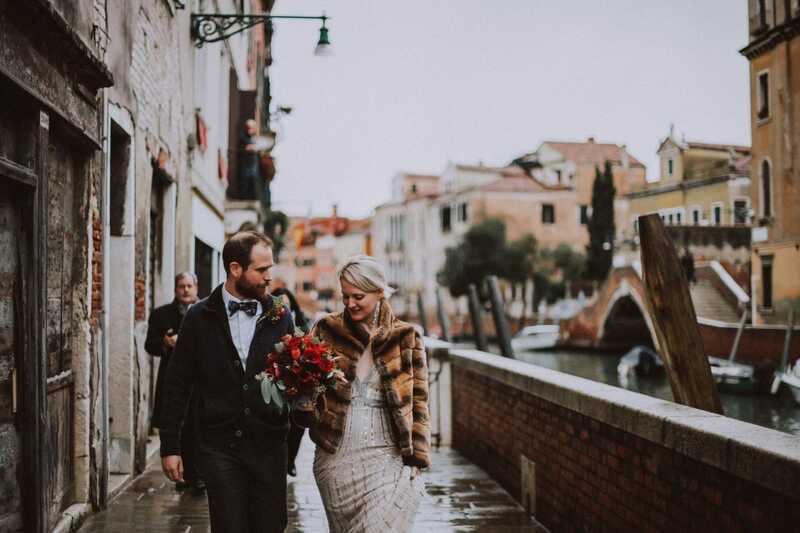 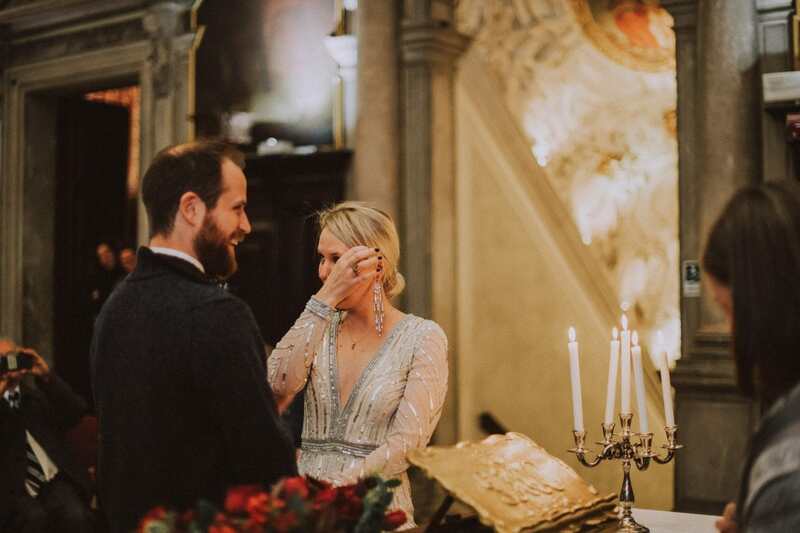 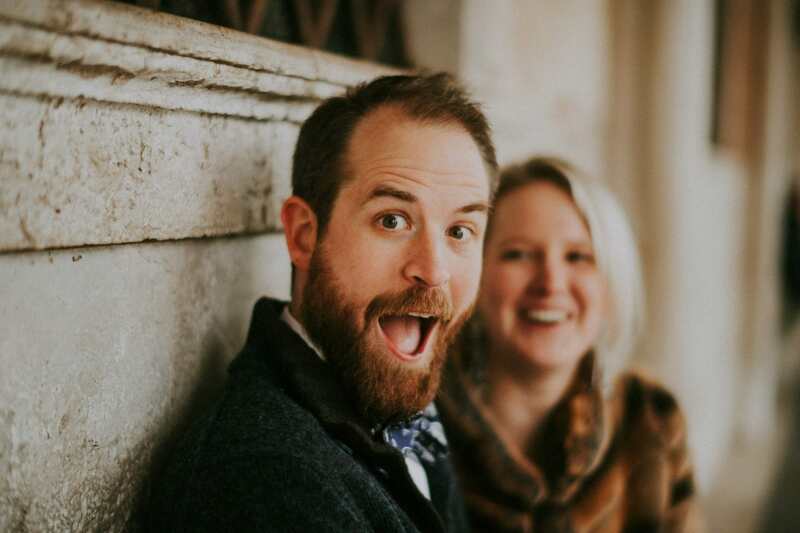 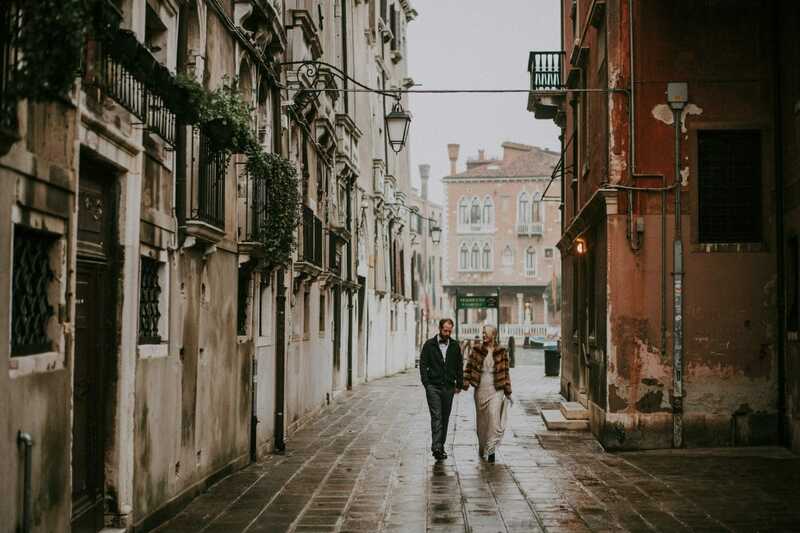 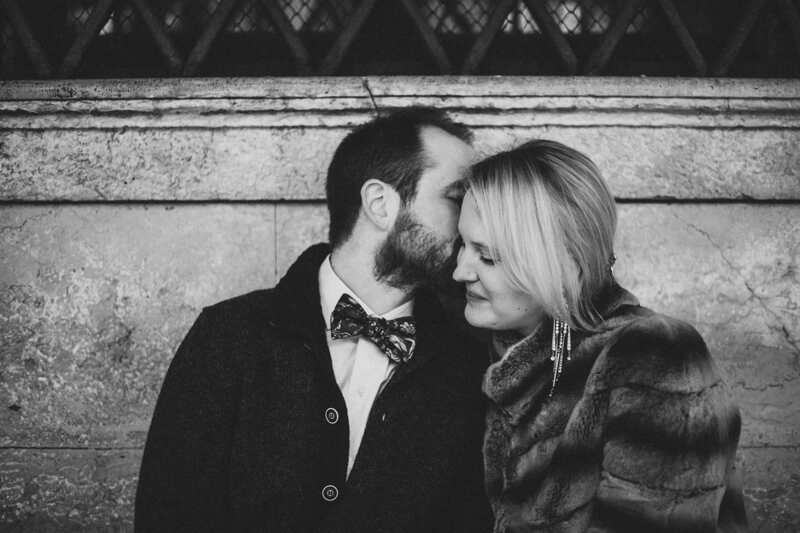 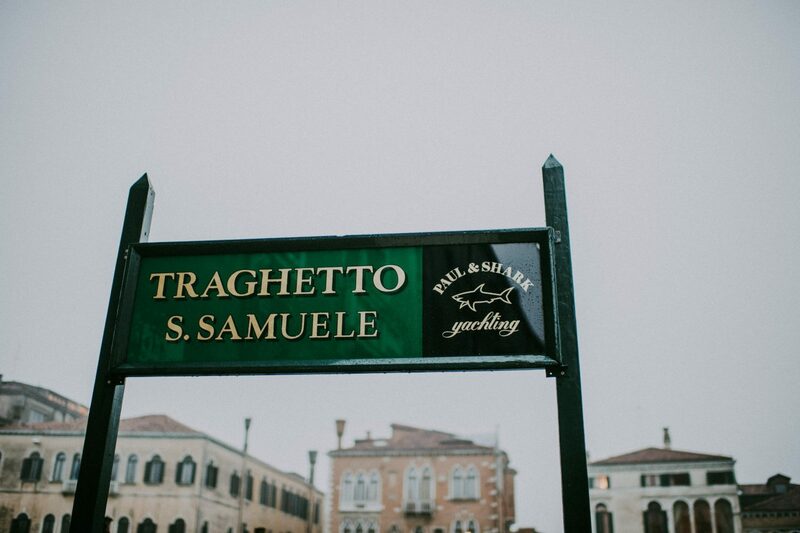 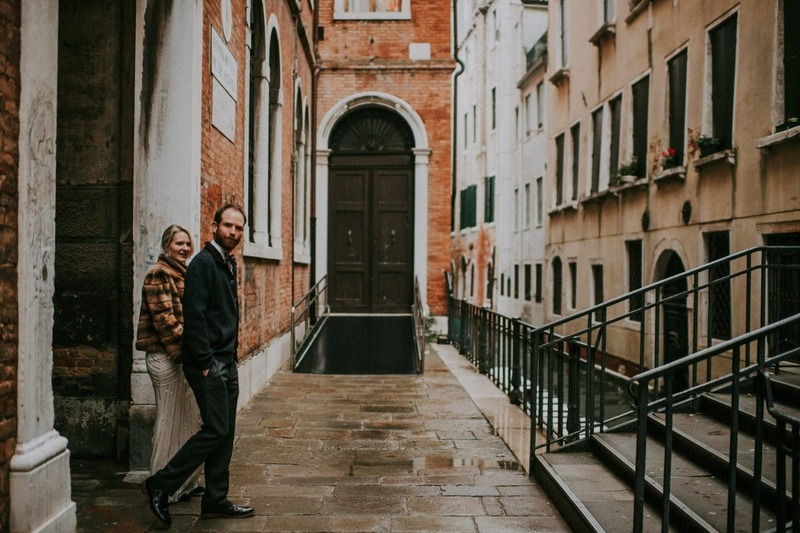 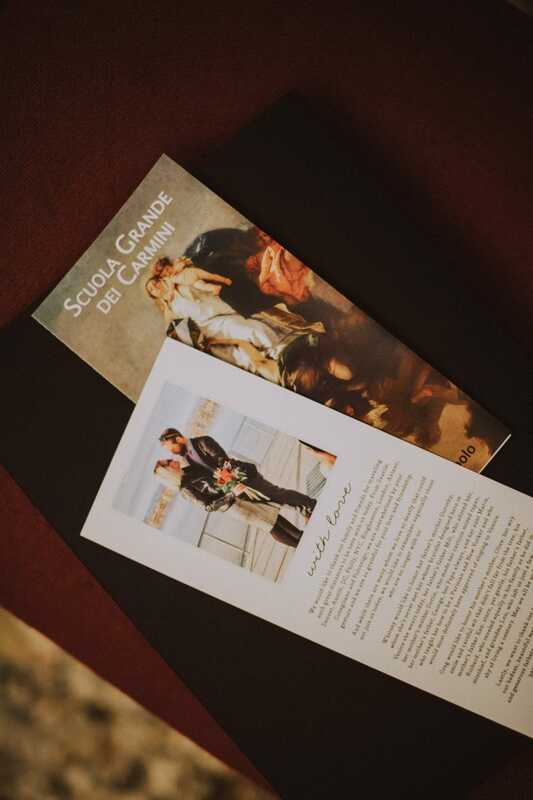 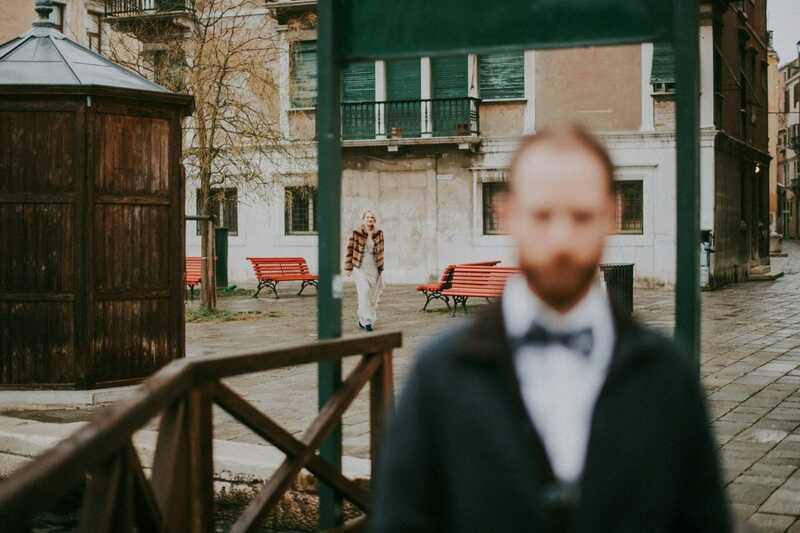 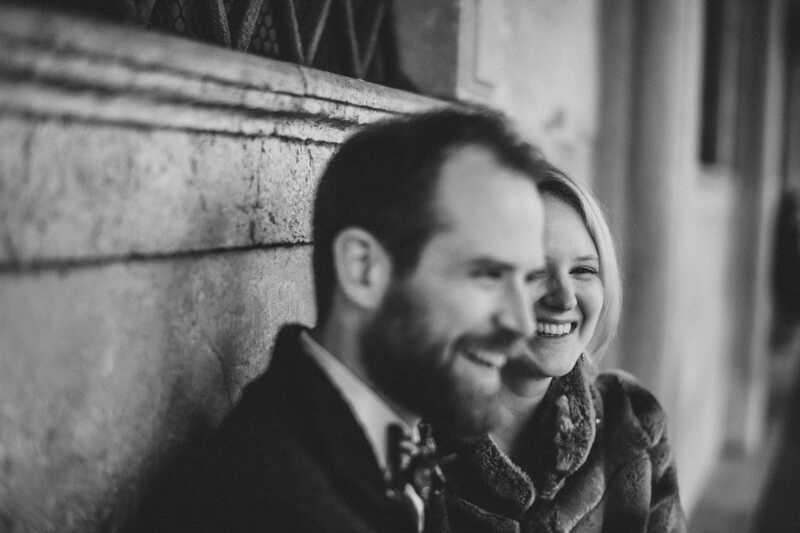 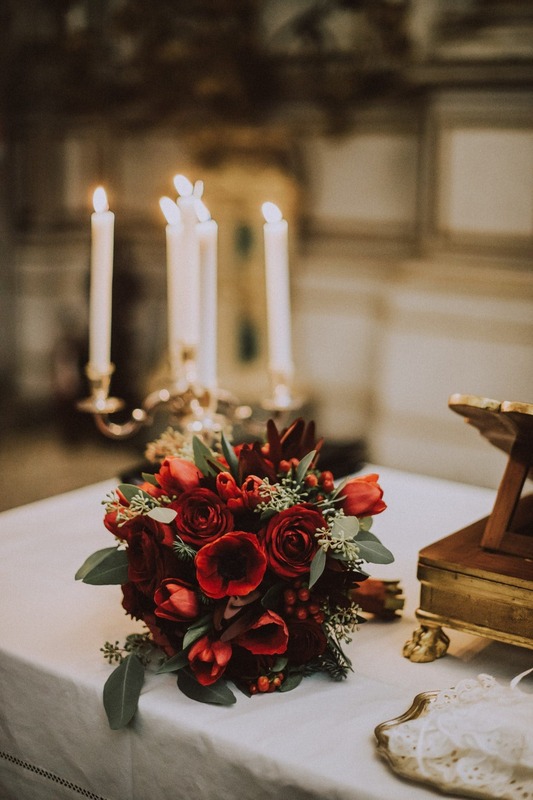 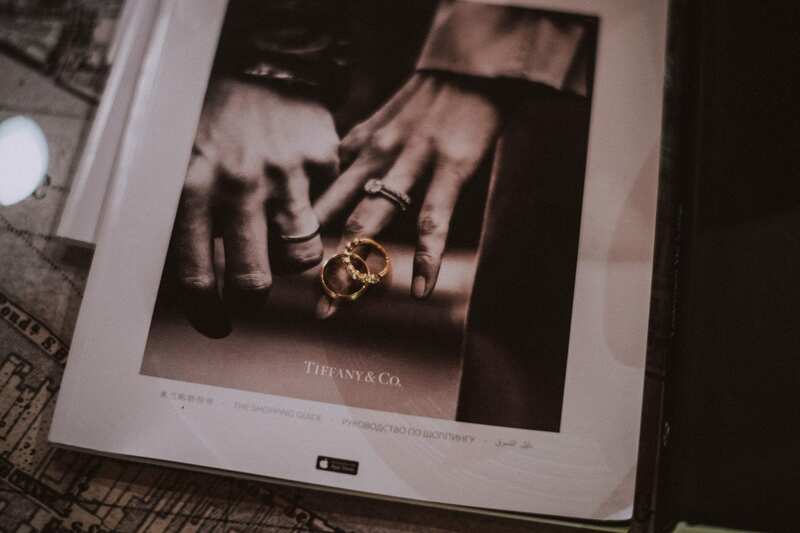 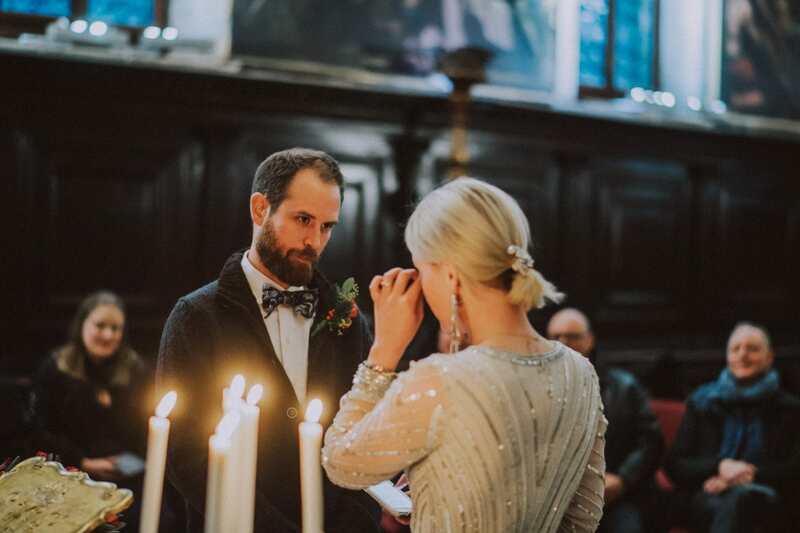 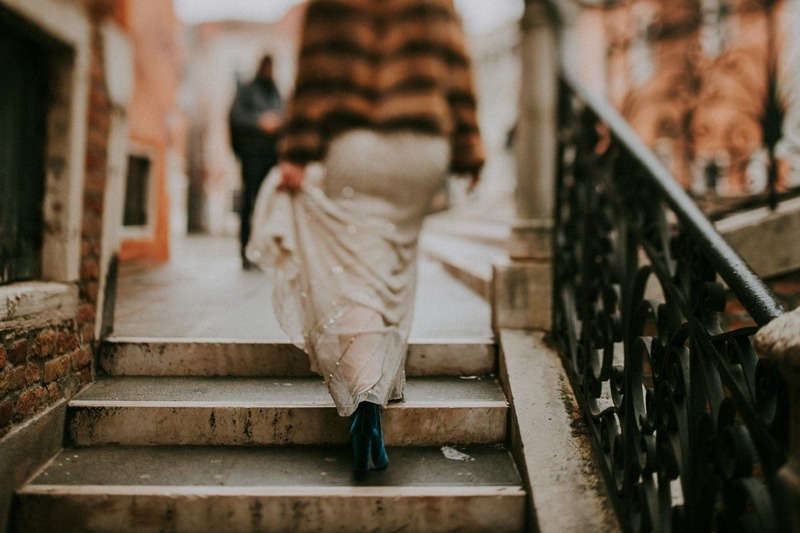 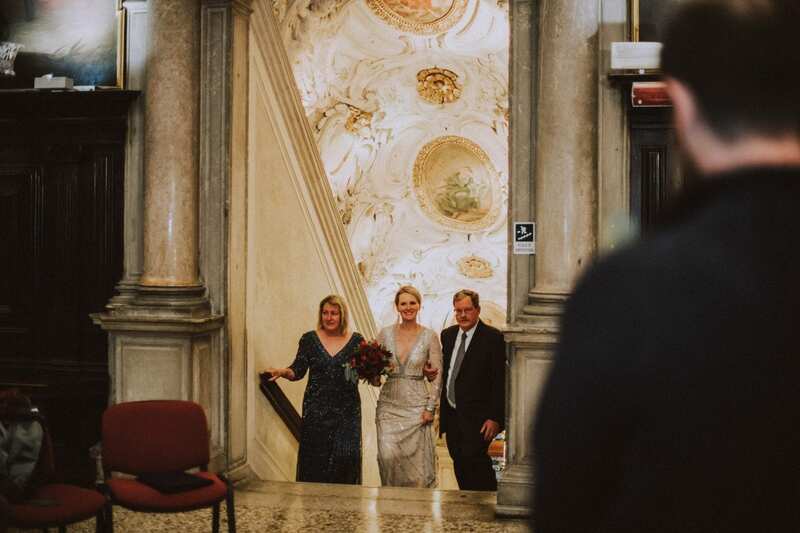 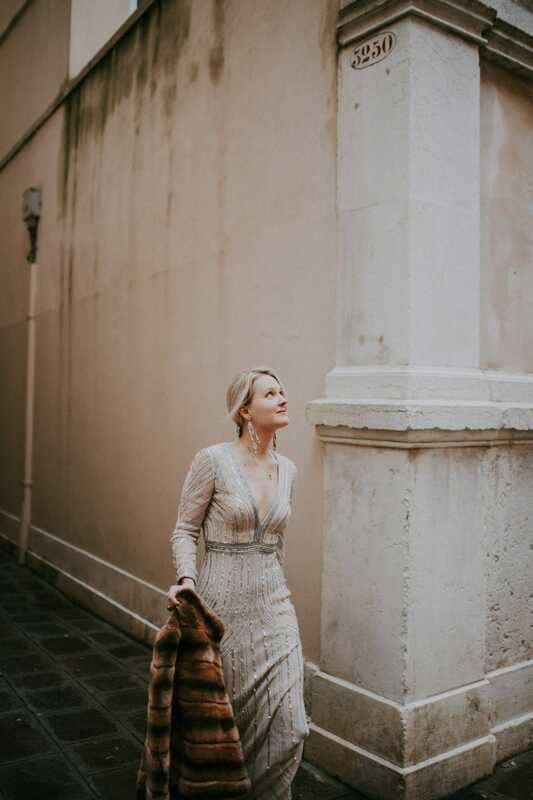 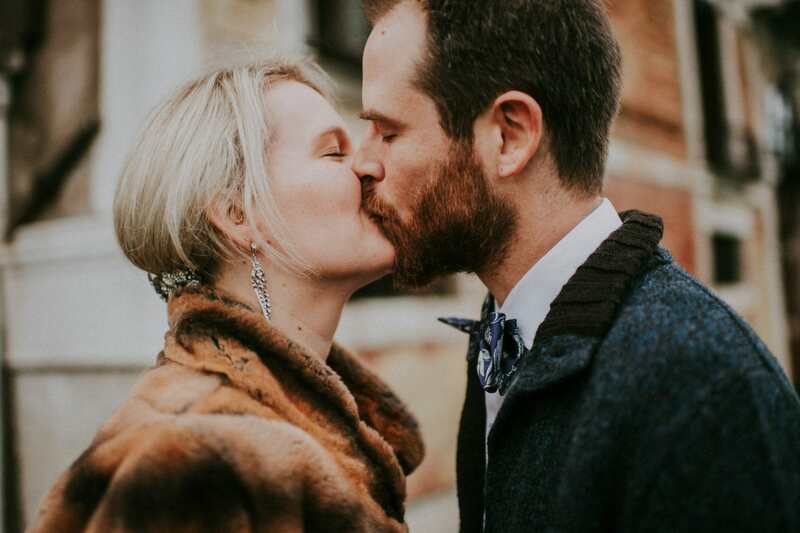 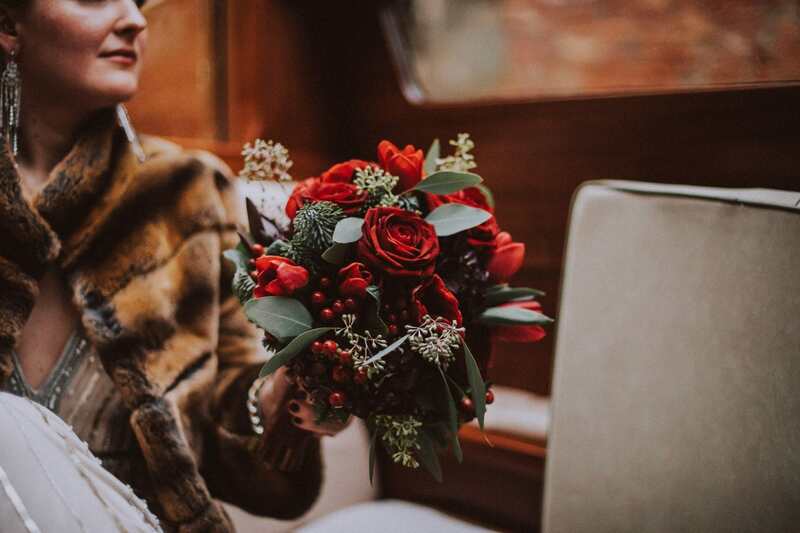 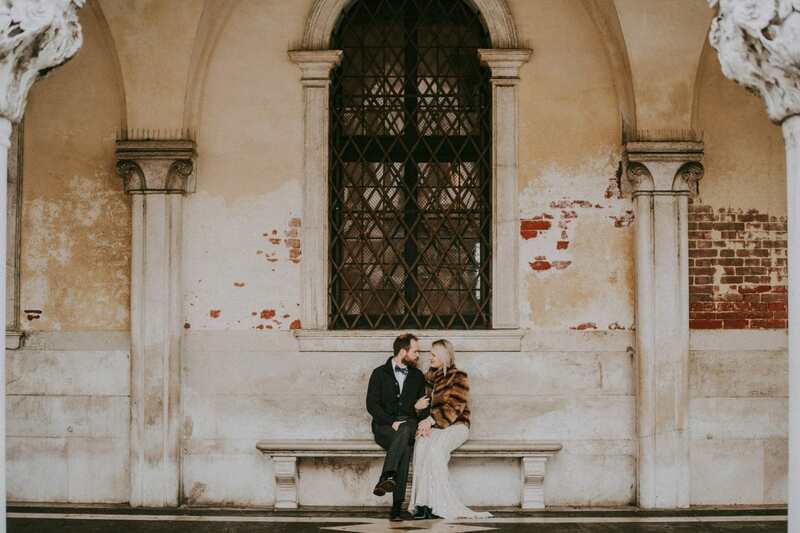 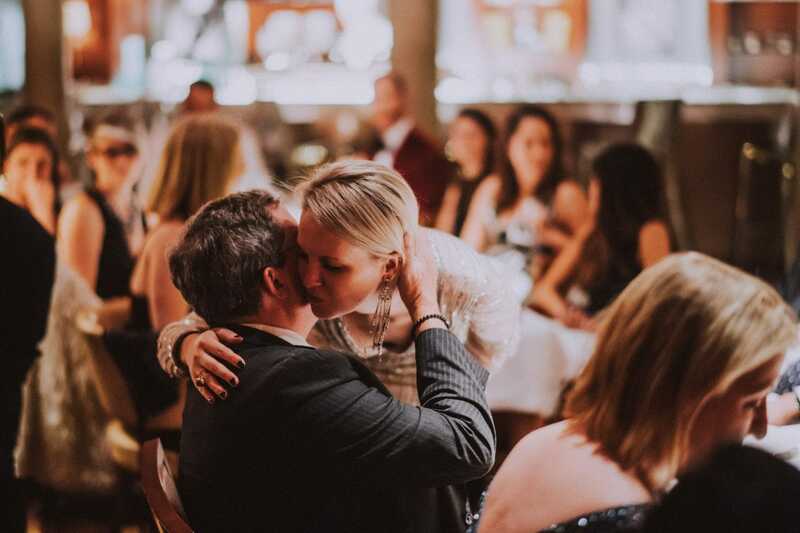 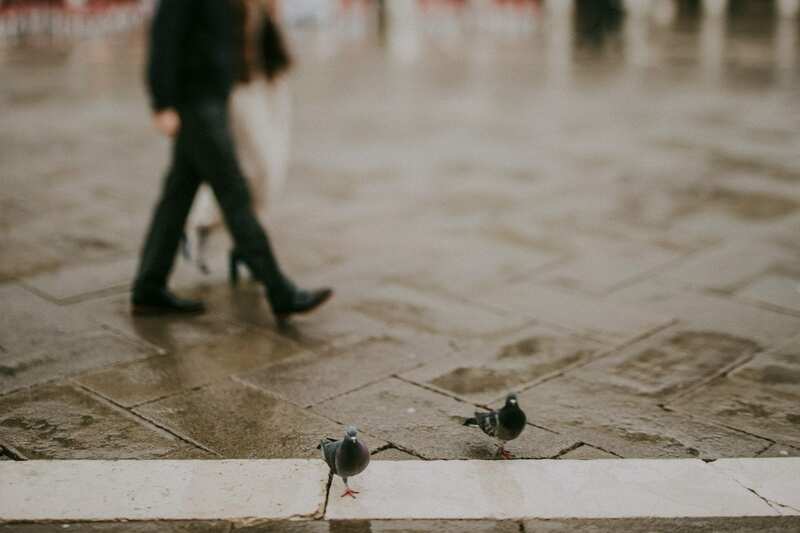 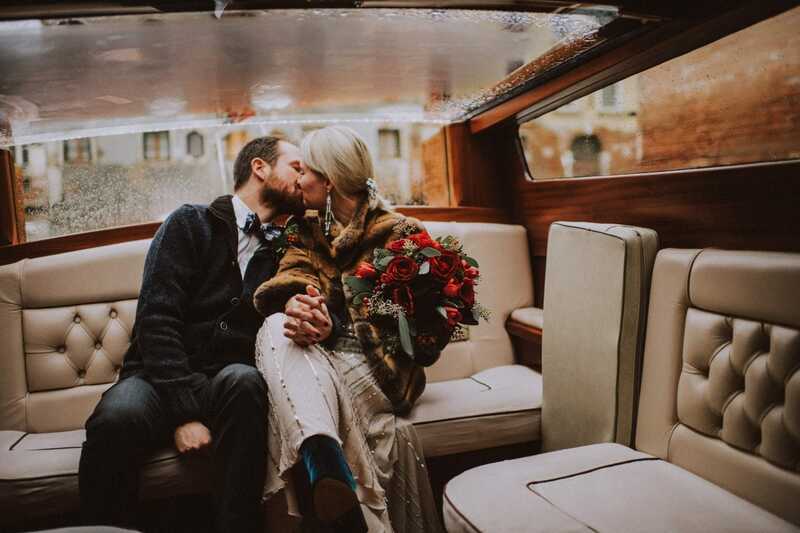 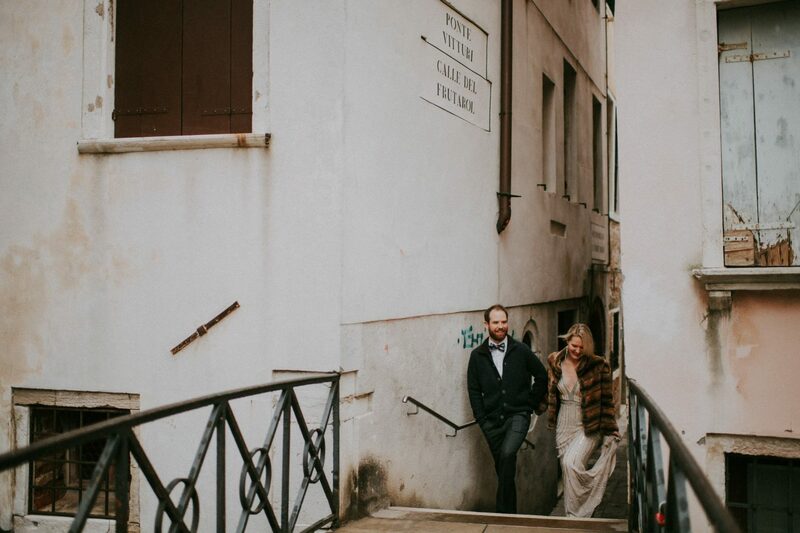 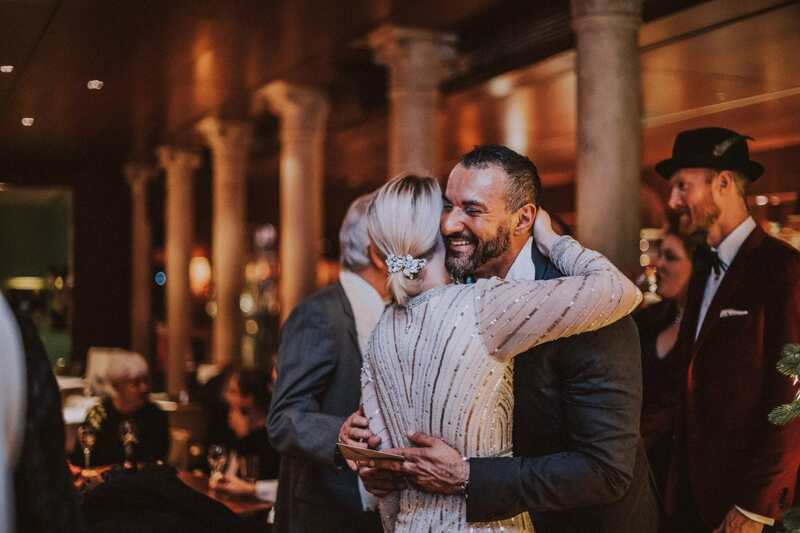 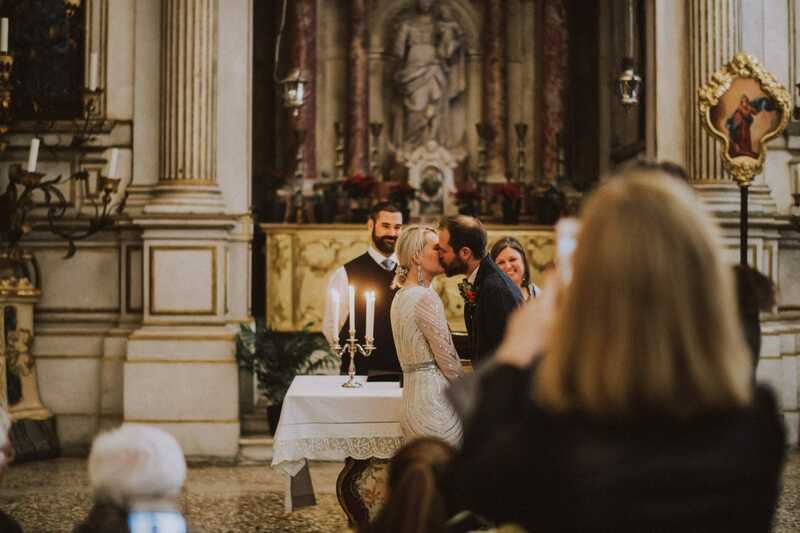 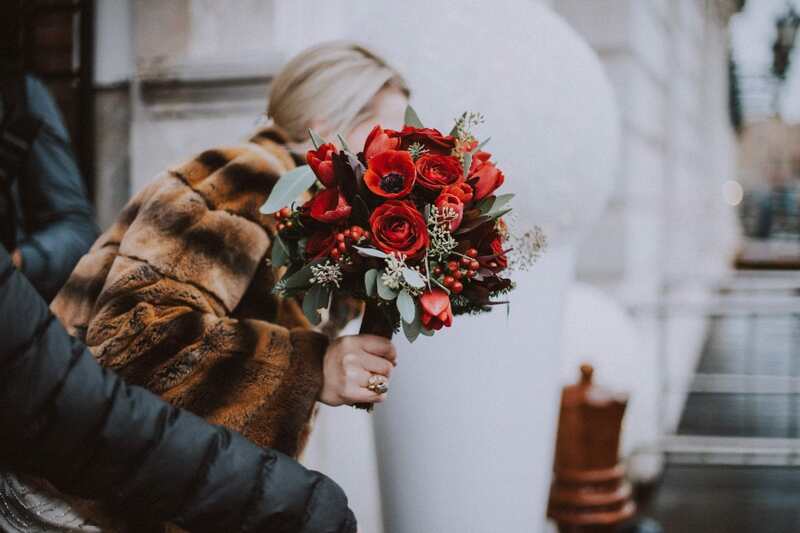 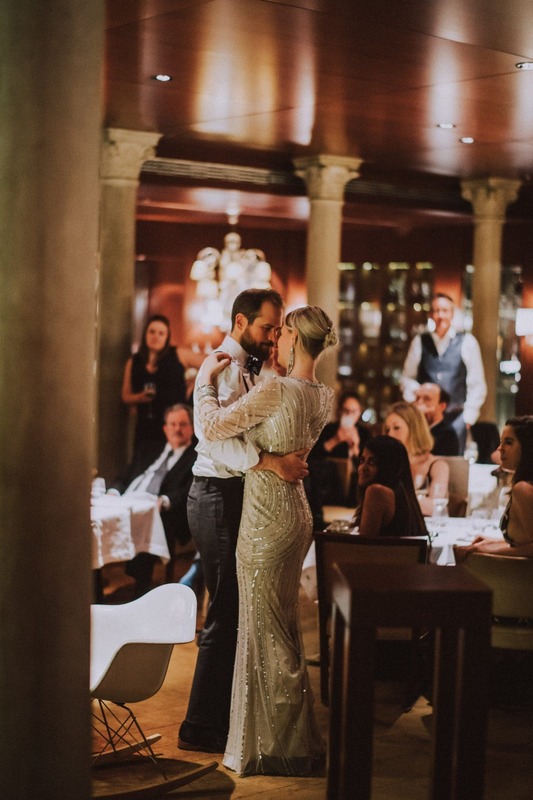 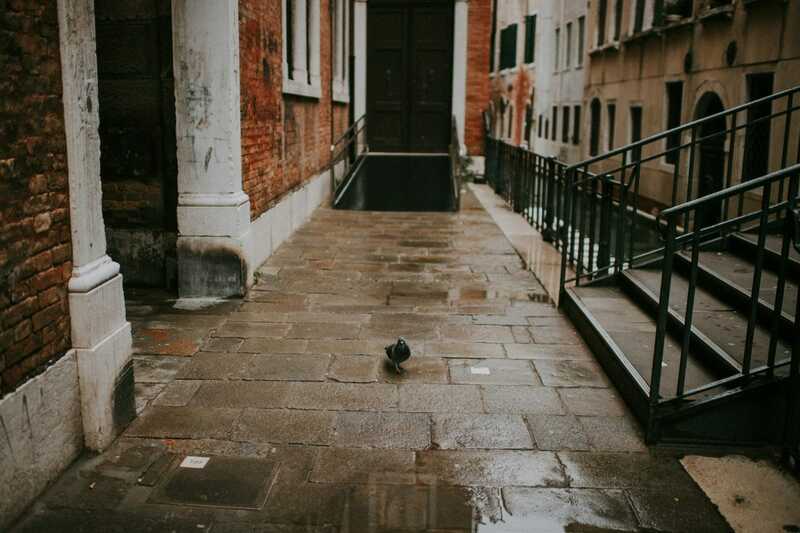 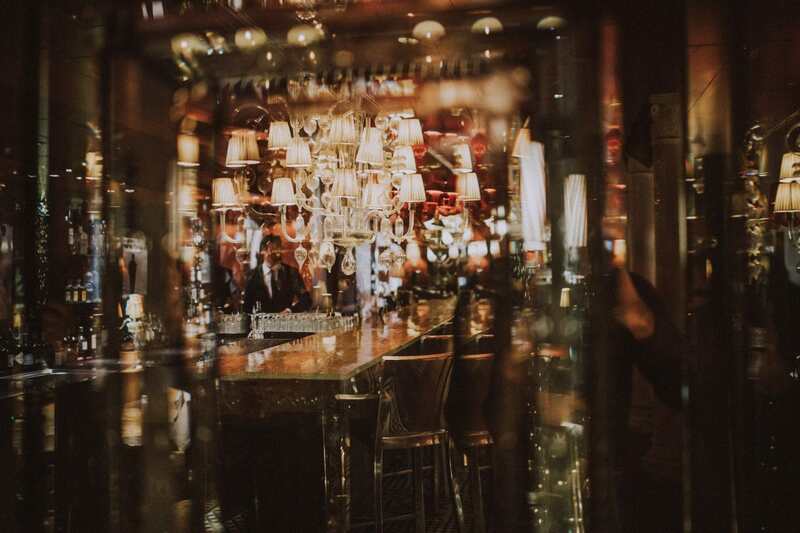 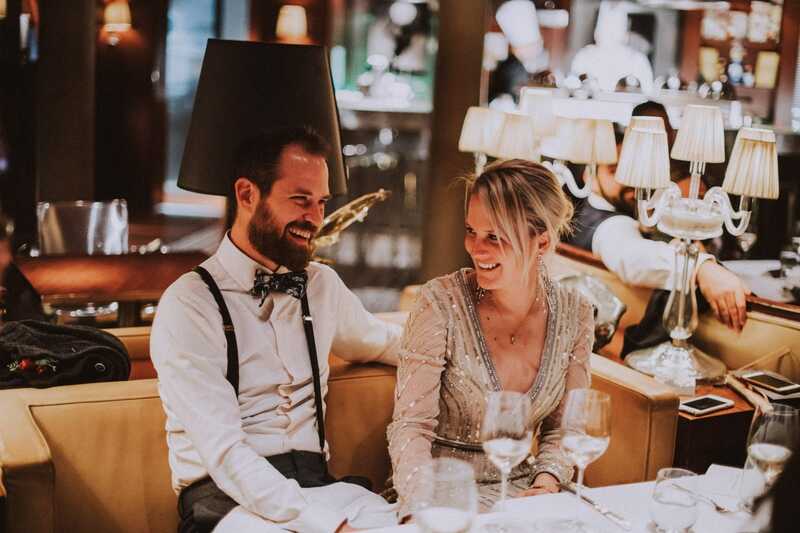 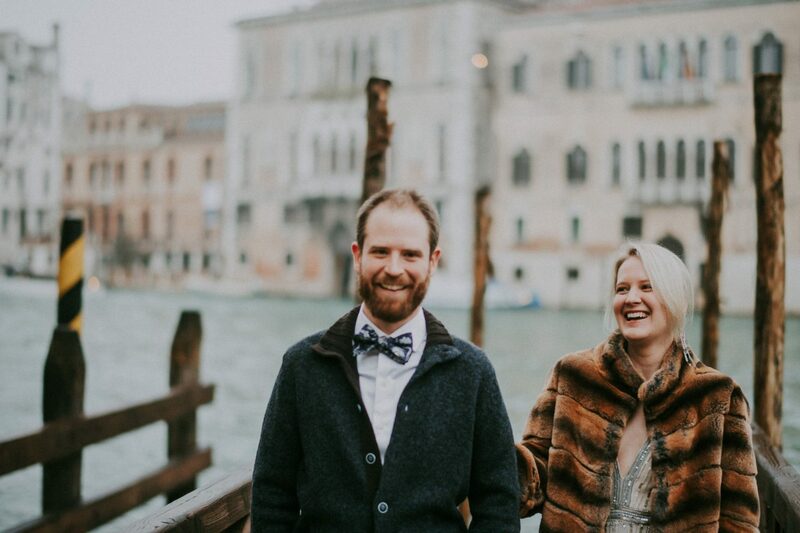 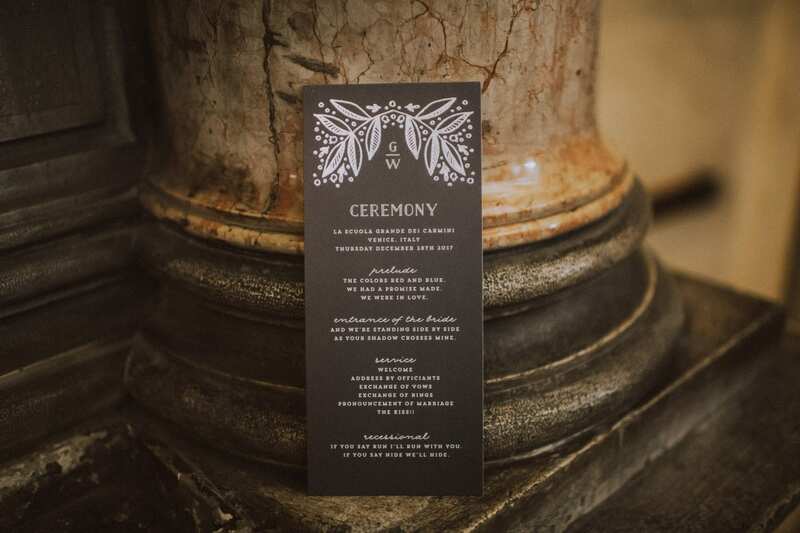 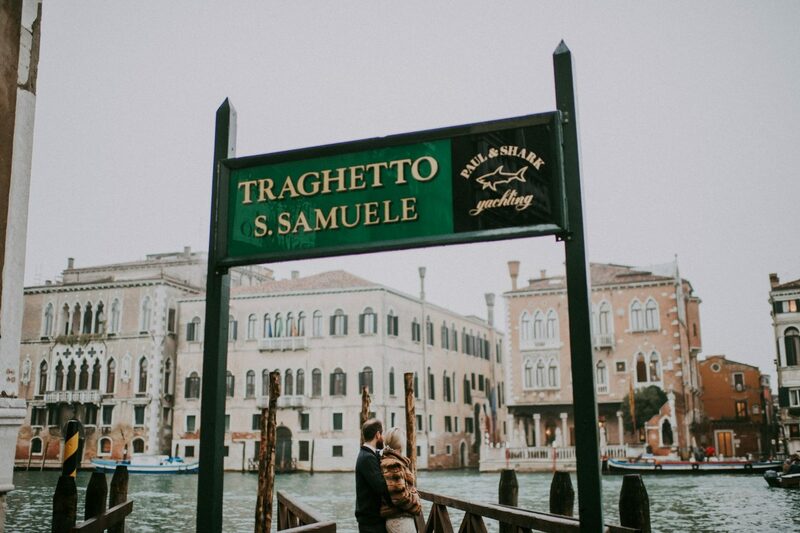 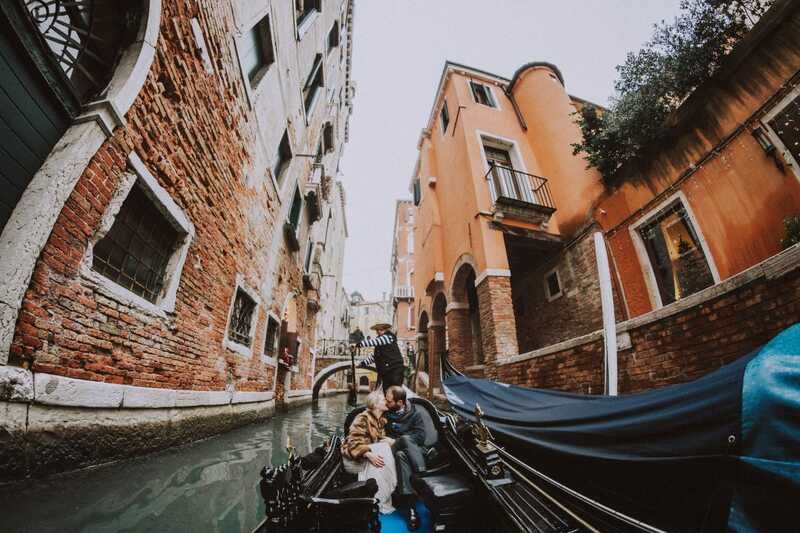 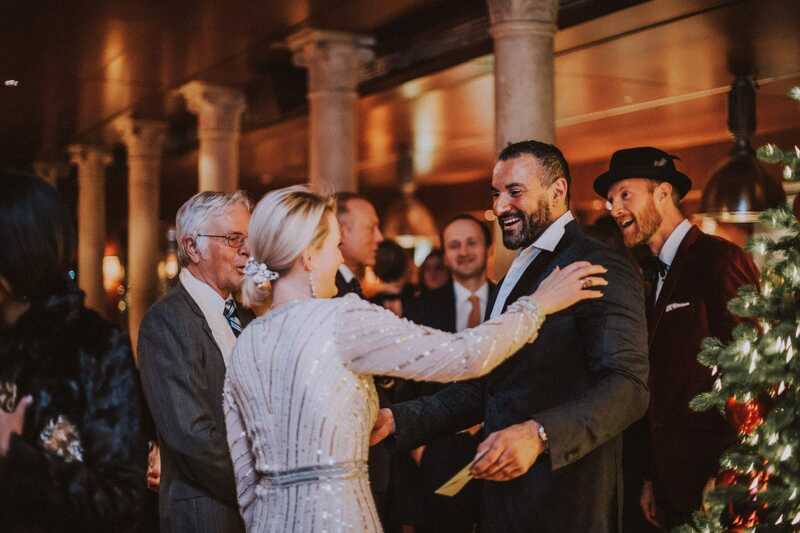 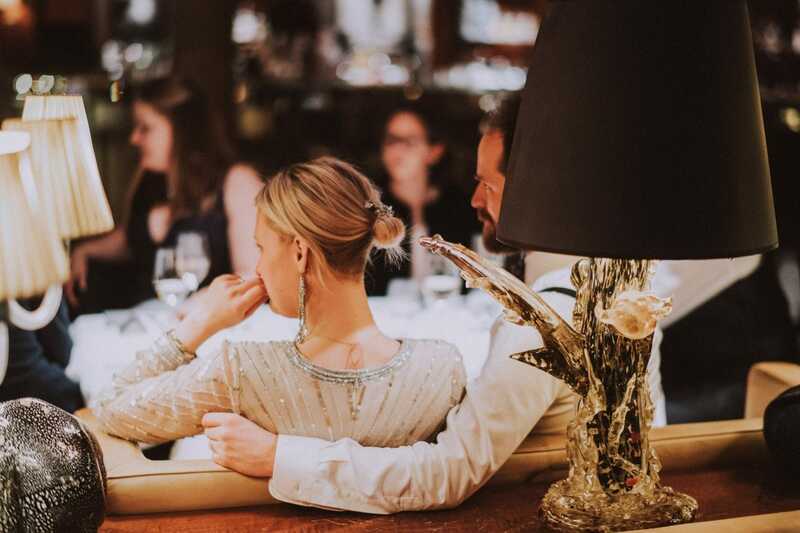 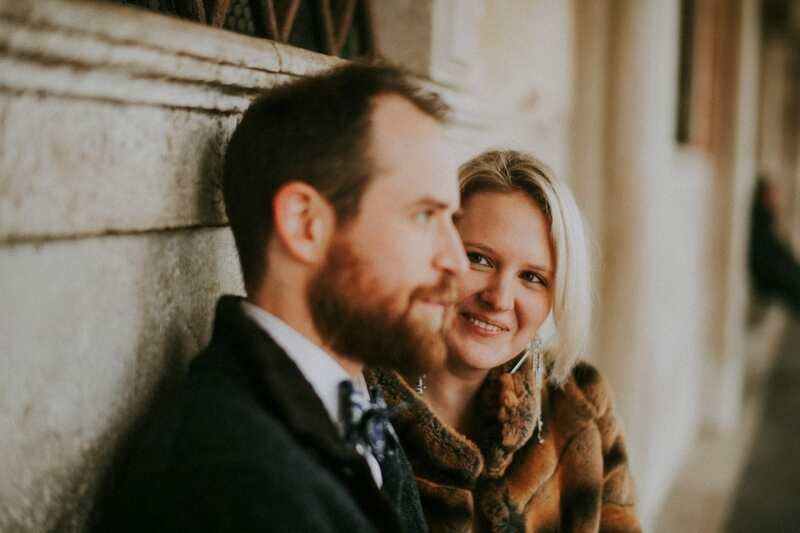 One year has passed since that super cold and moody day in Venice when we met Greg at Palazzina G. Whitney was getting ready upstairs alone; the first part of their big day was dedicated solely to these lovebirds. 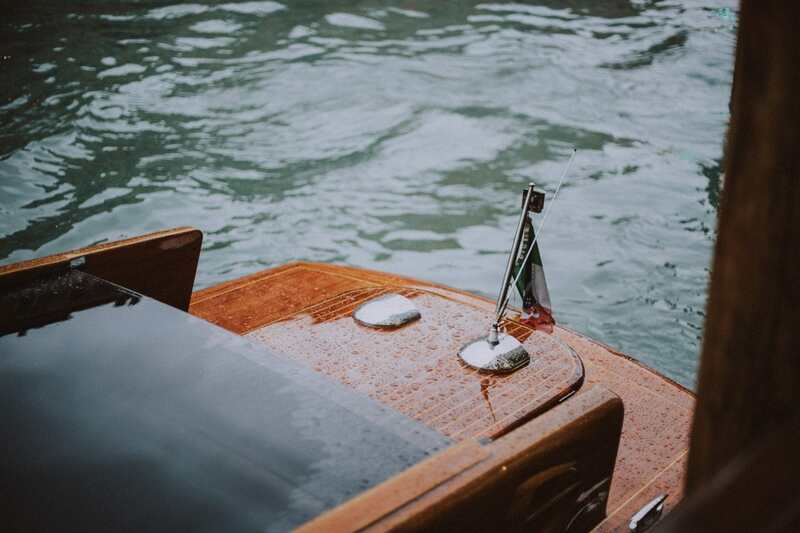 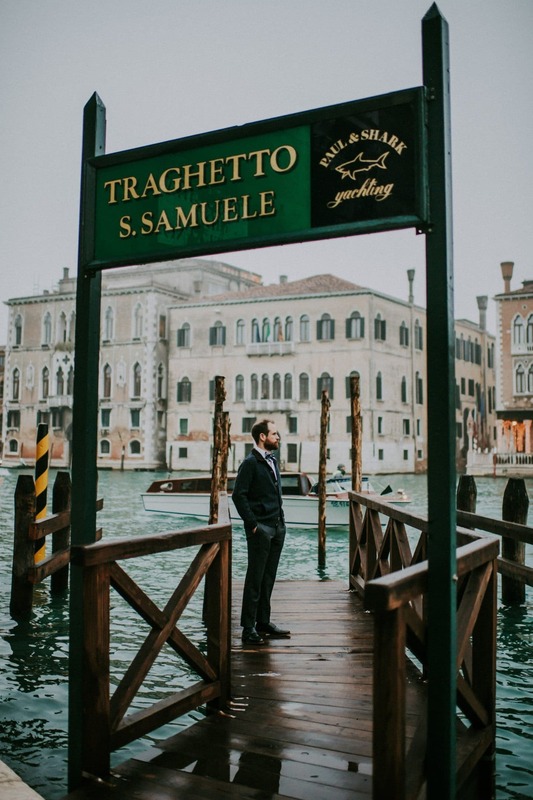 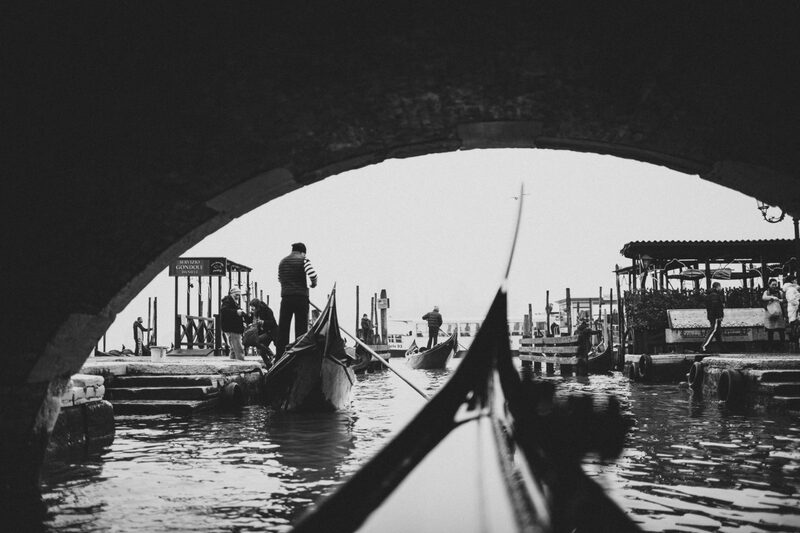 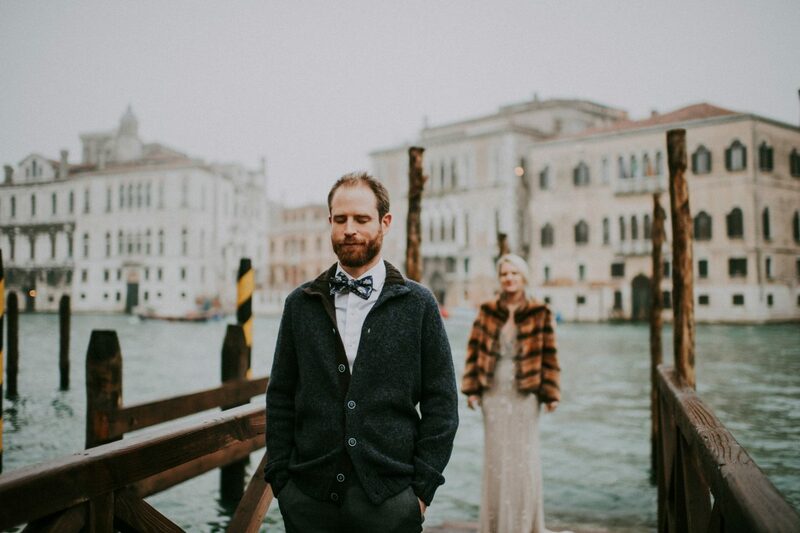 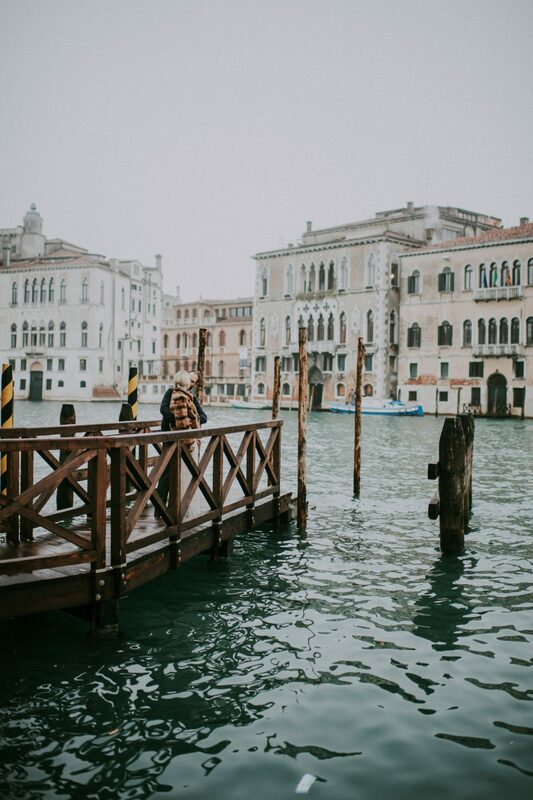 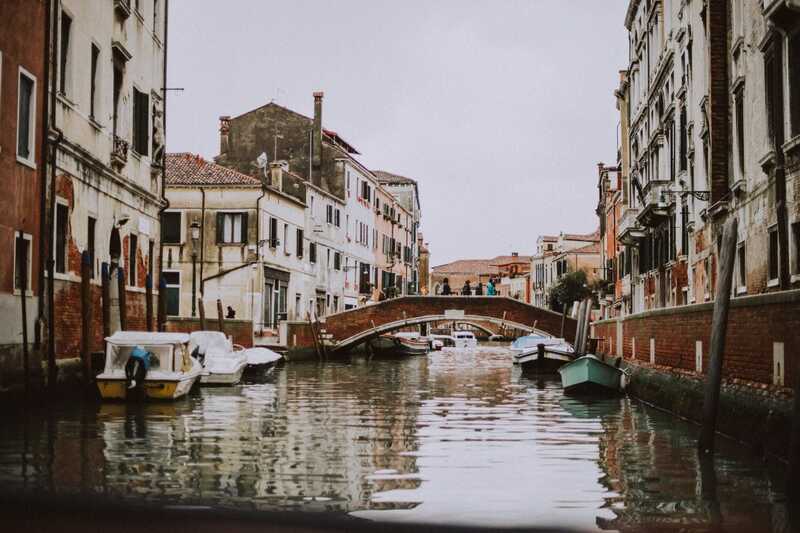 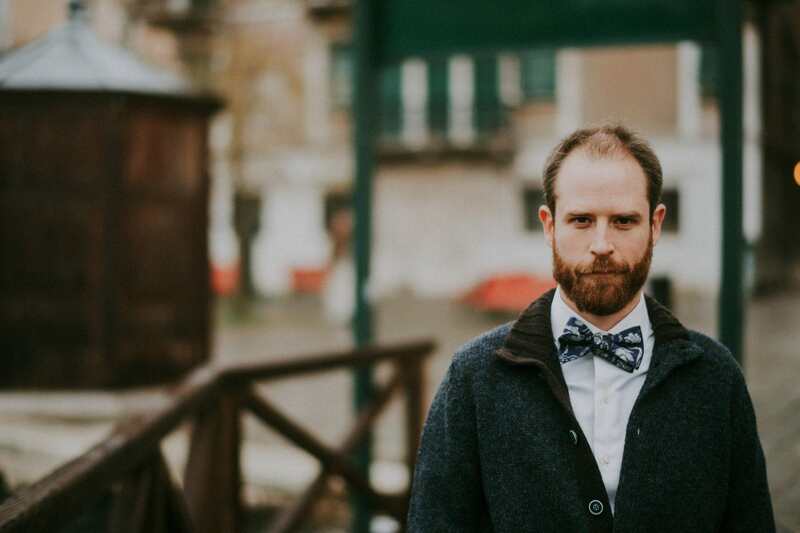 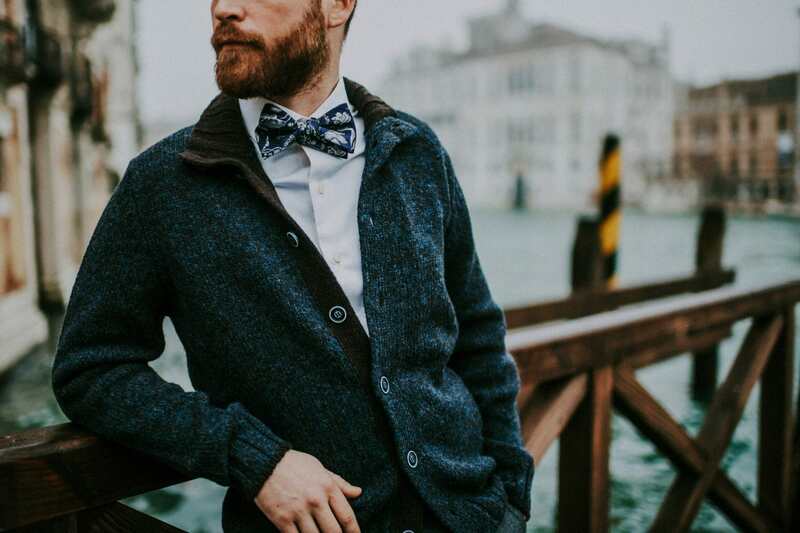 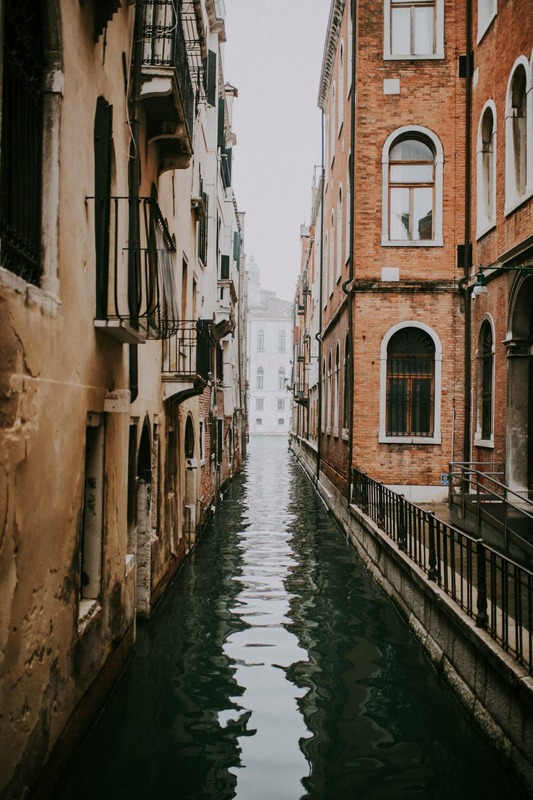 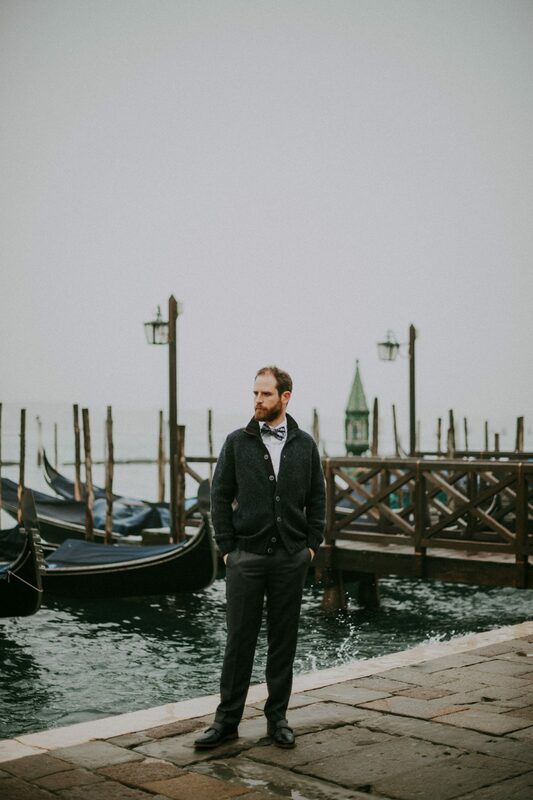 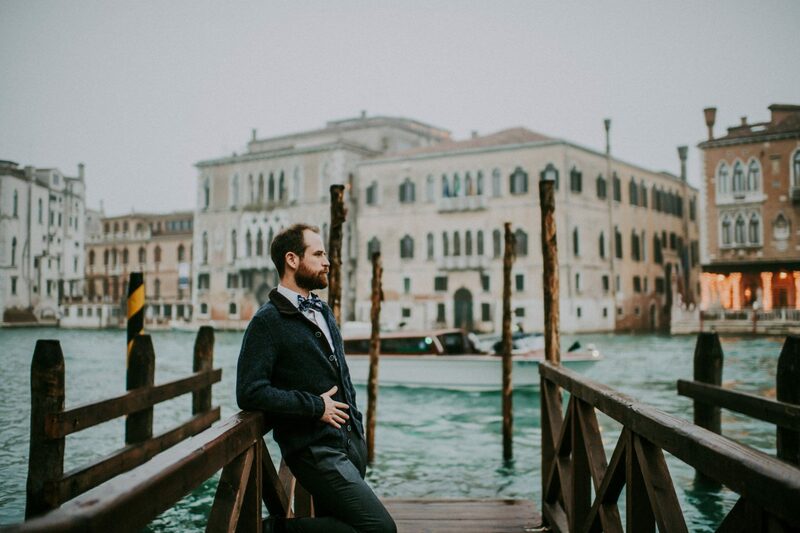 The first look on a dock overlooking the Grand canal was a mixture of excitement and deep feeling. 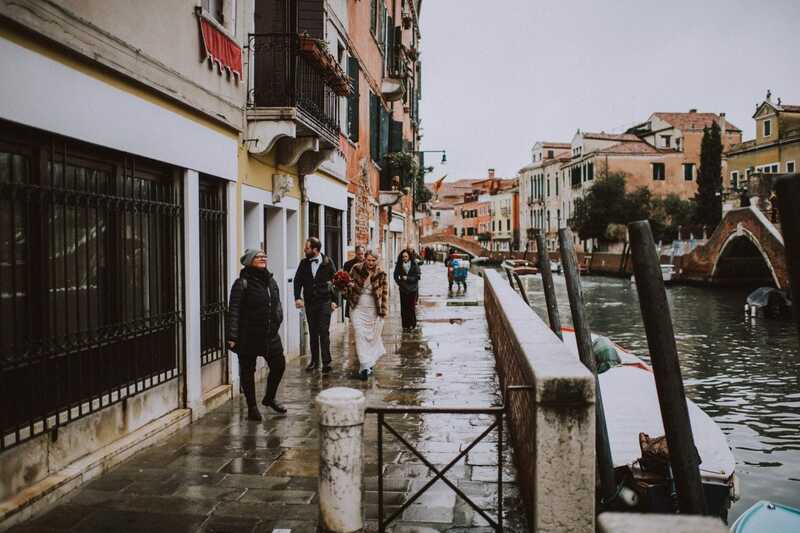 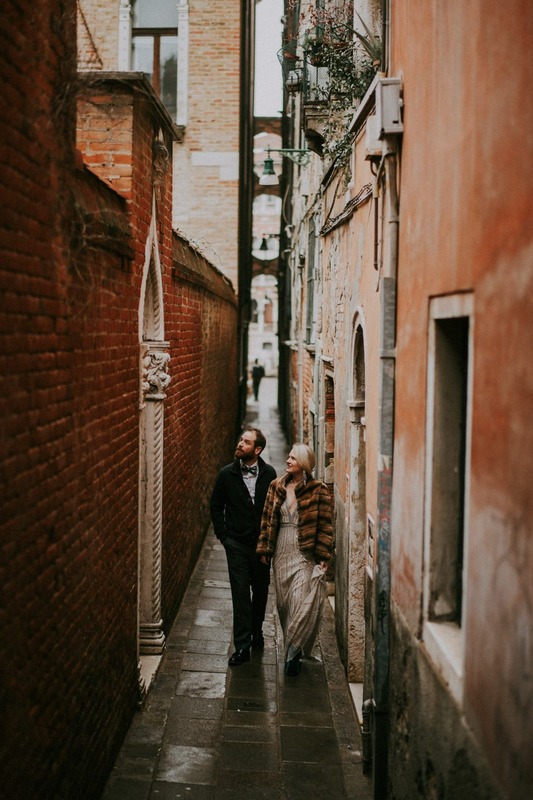 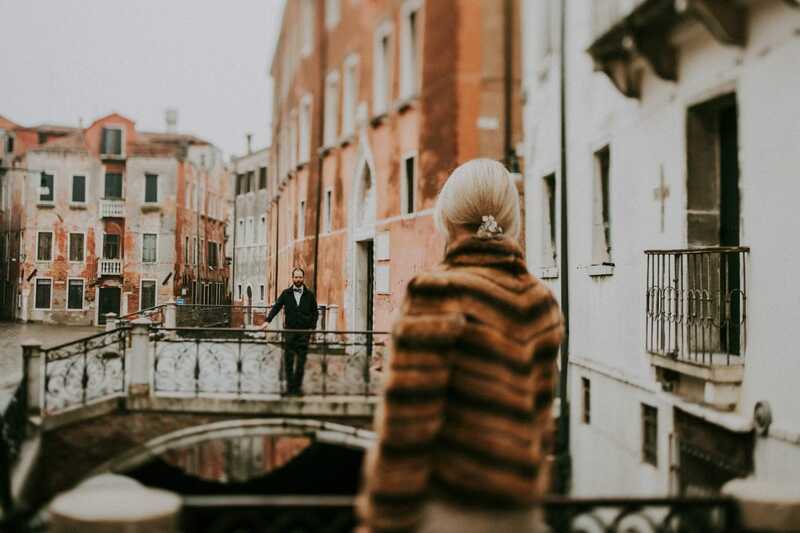 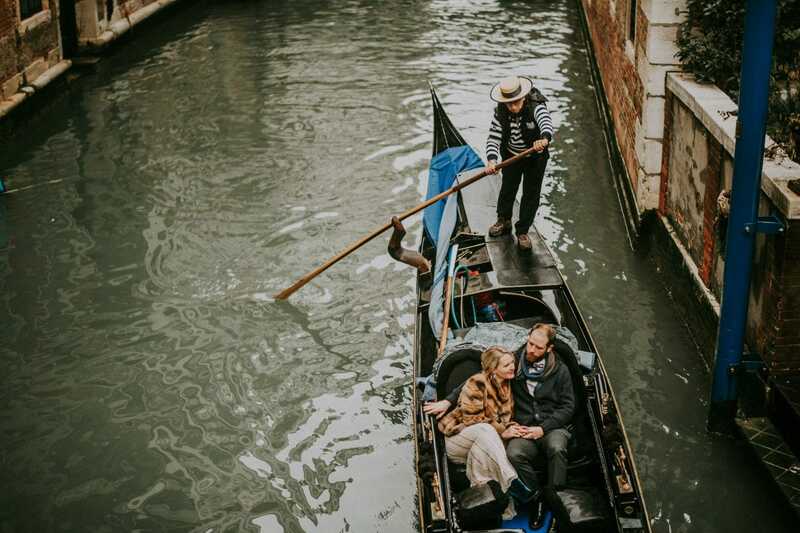 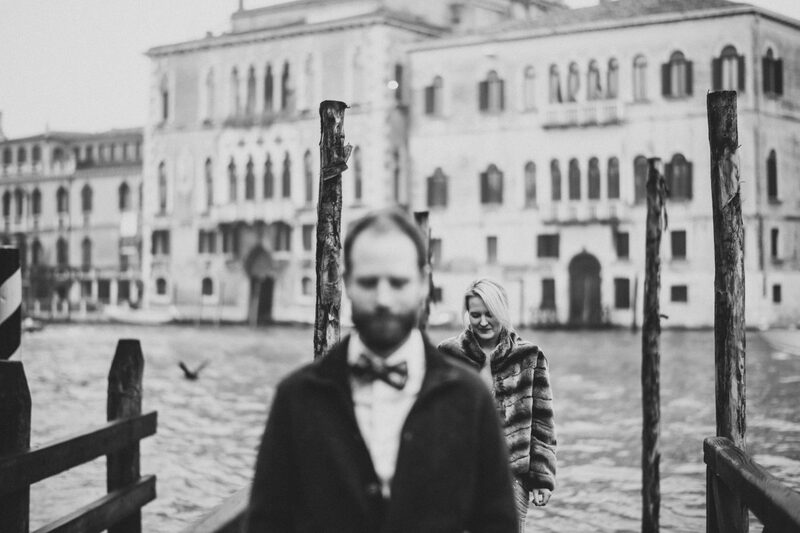 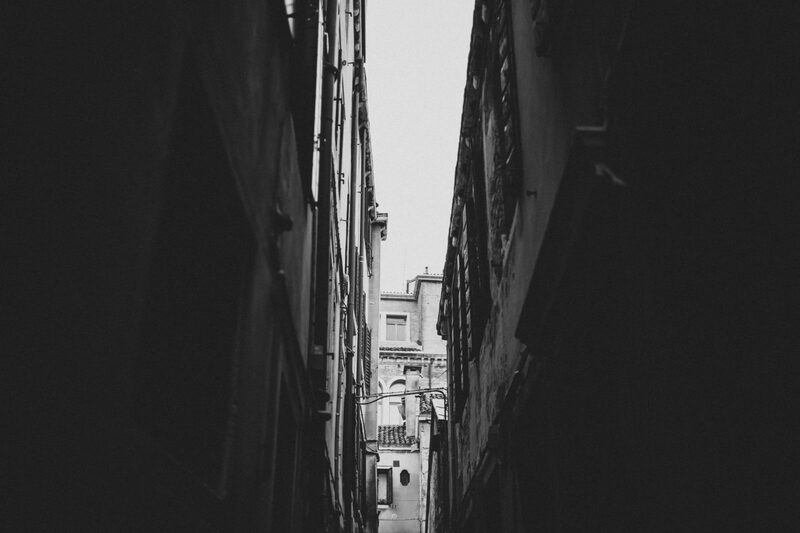 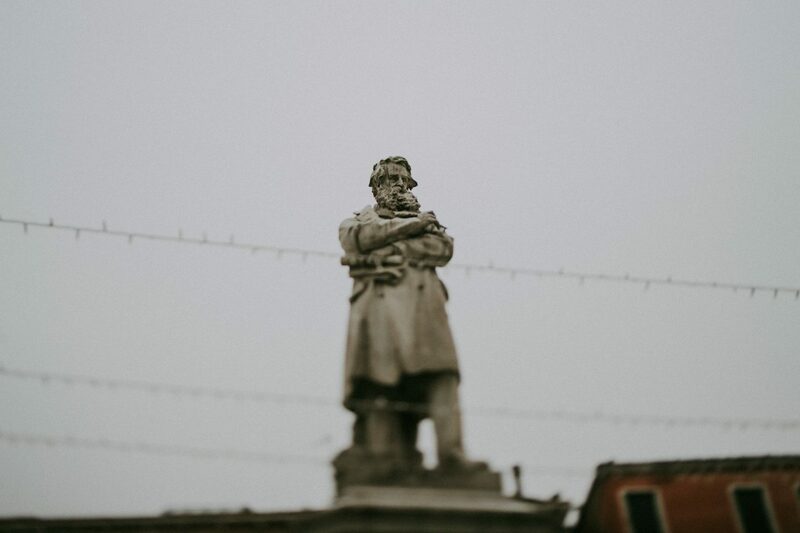 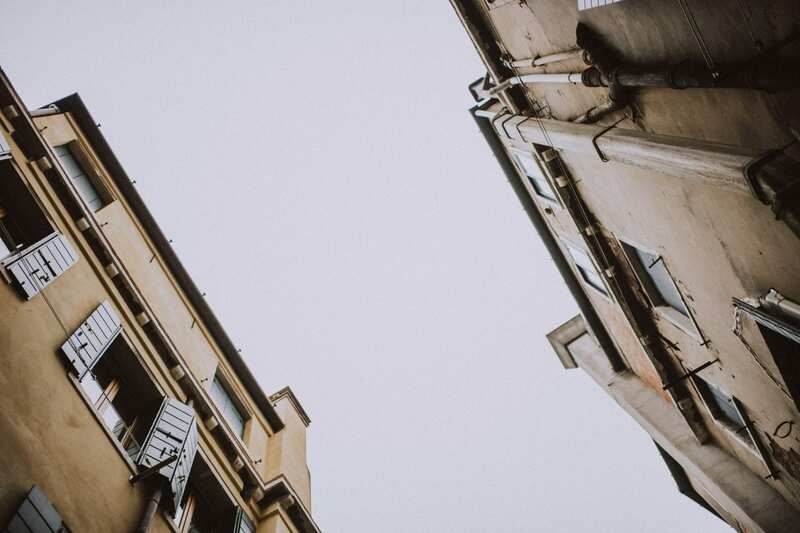 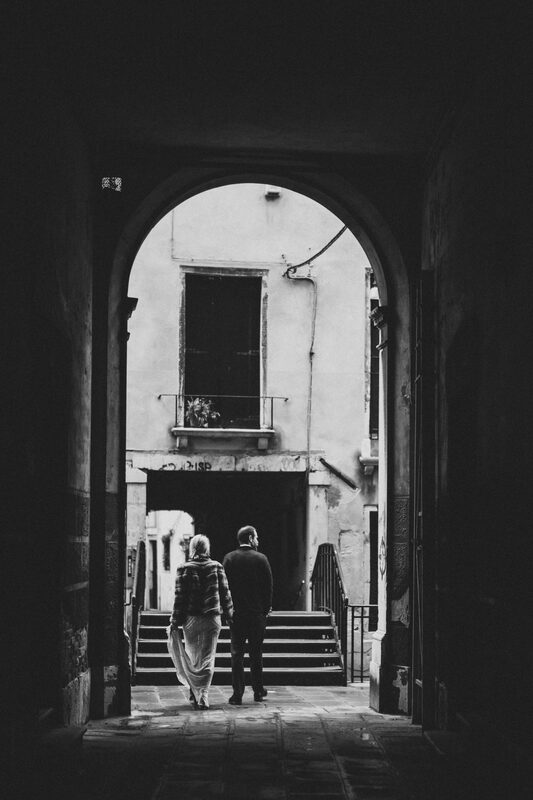 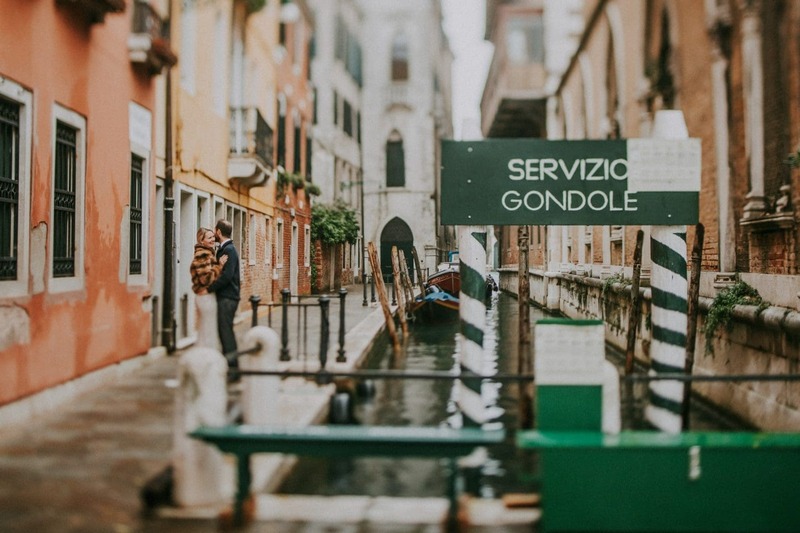 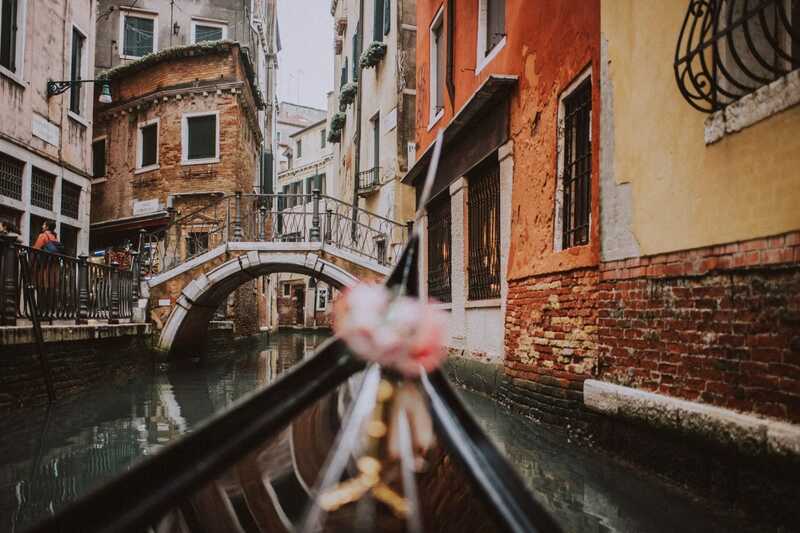 I still remember the cold during the couple photoshoot reaching San Marco area! 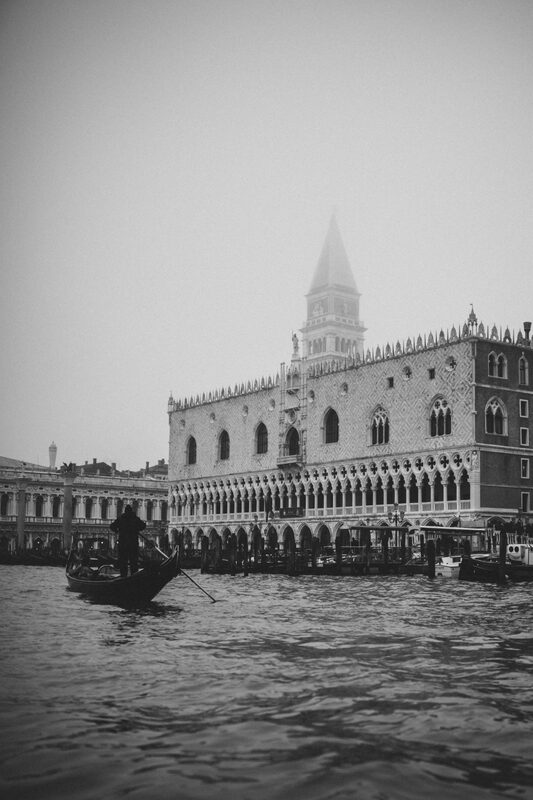 A moody touch was given by a not thick fog. 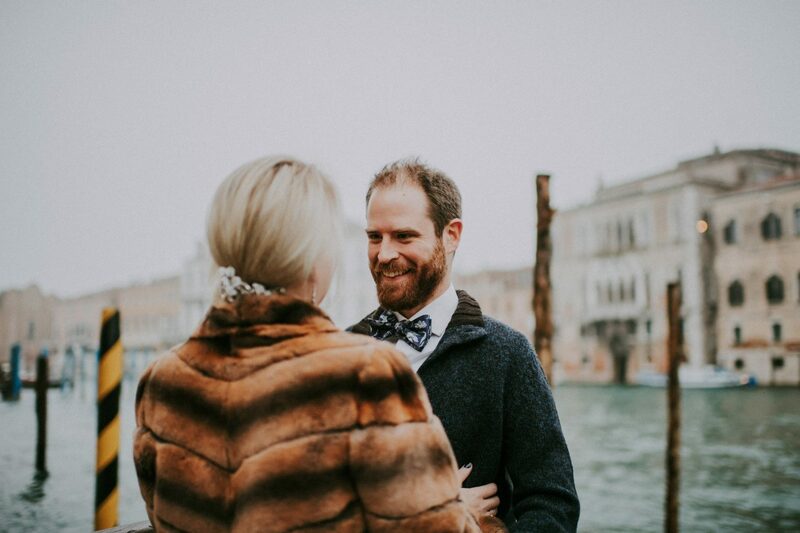 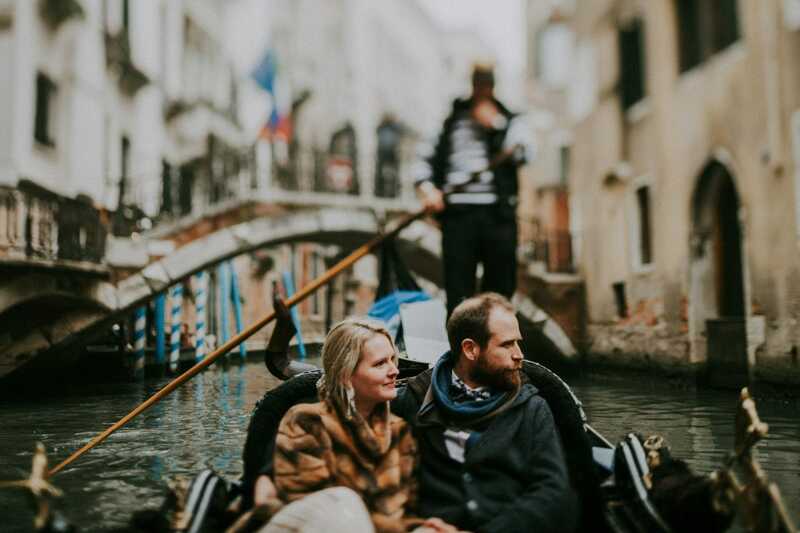 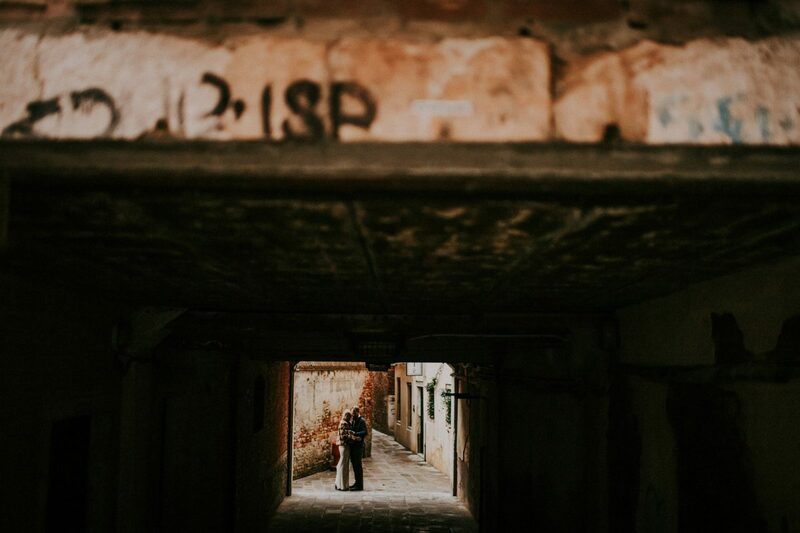 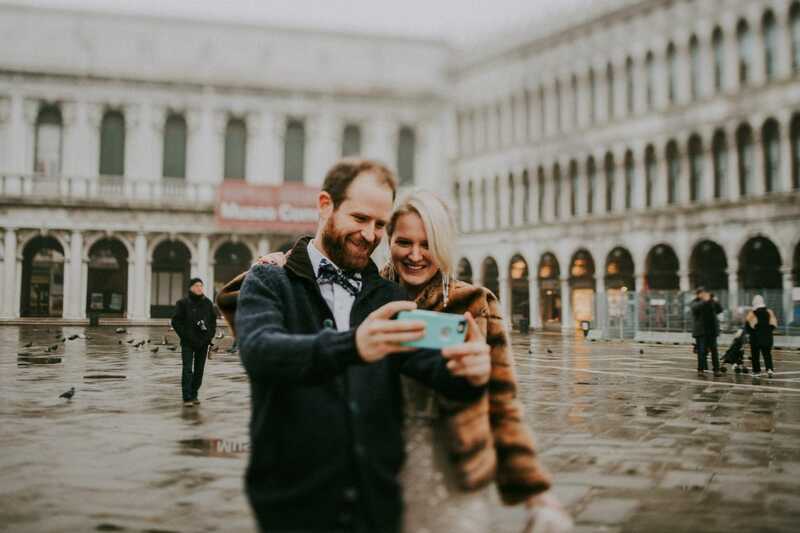 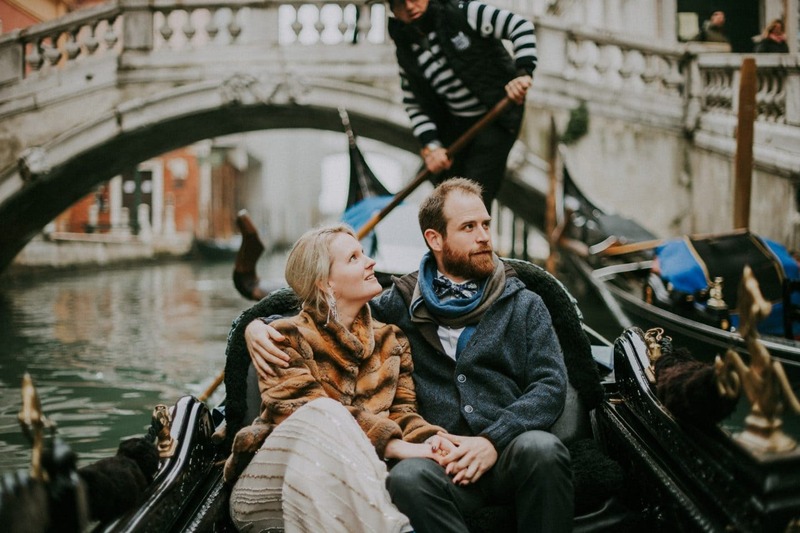 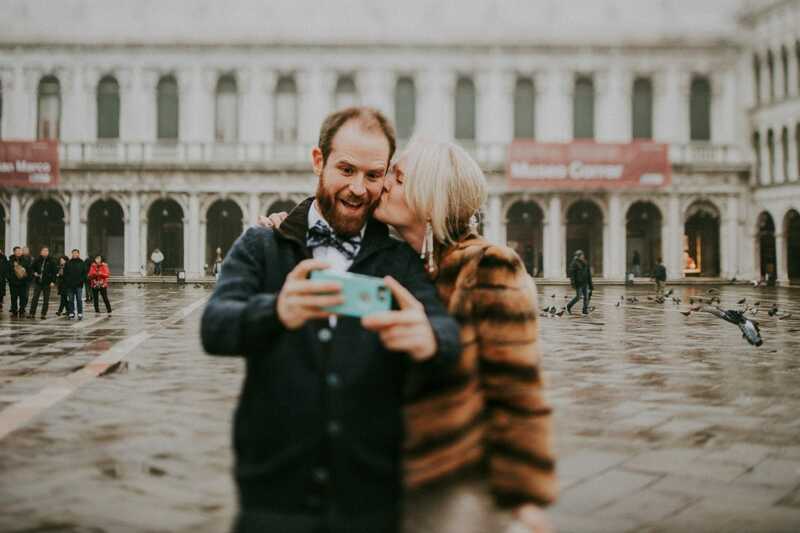 It was a pleasure to portray this gorgeous couple in San Marco’s square and the shore, enjoying the charming view on San Giorgio island surrounded by many gondolas. 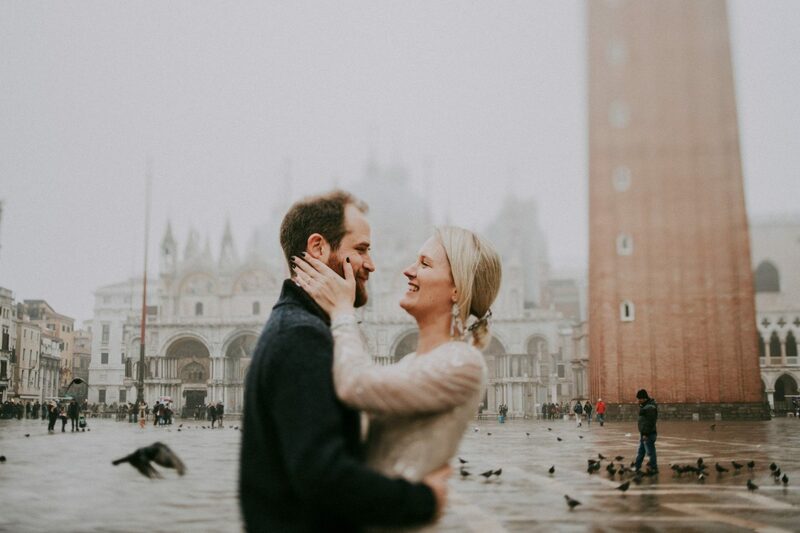 Here the fog made its magic. 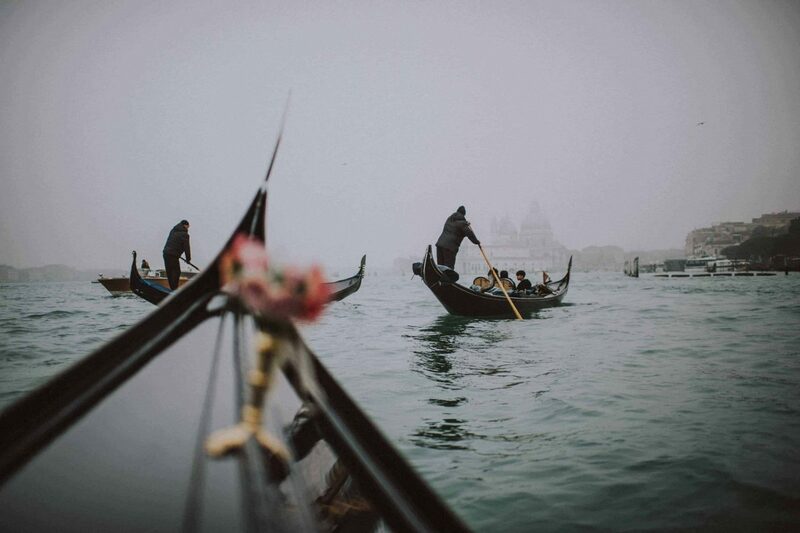 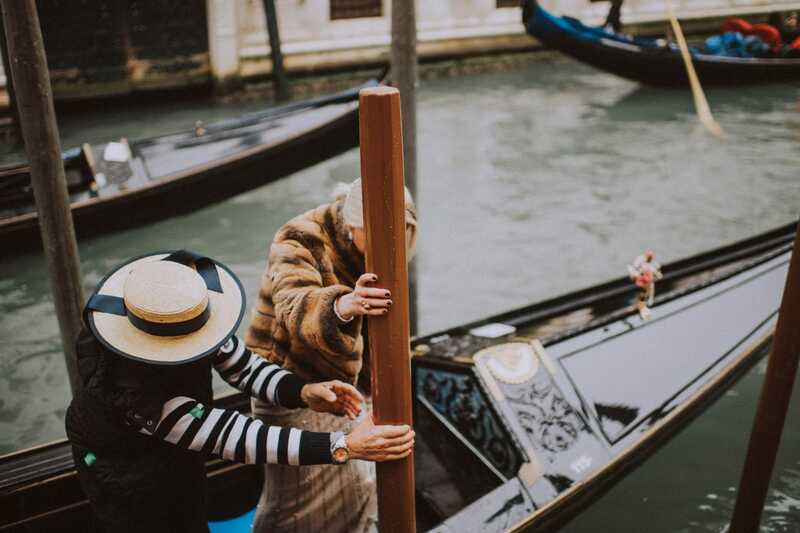 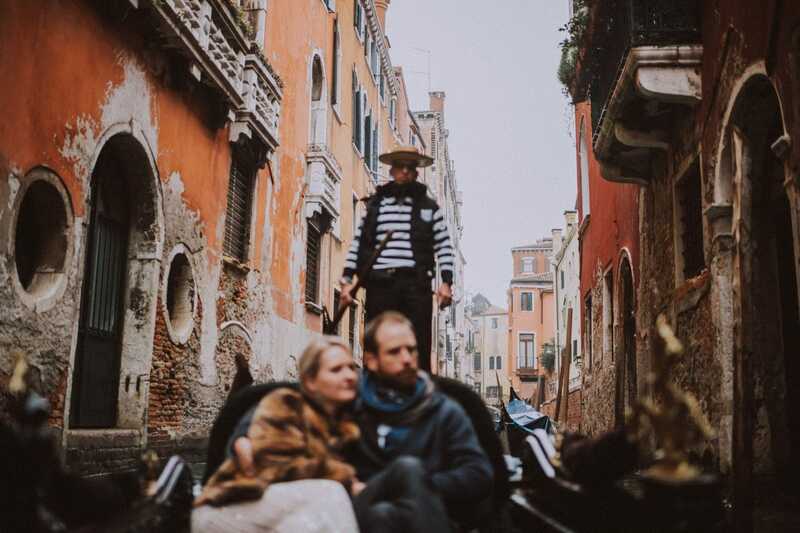 Of course, despite the super cold a gondola ride couldn’t miss as cherry on the top of the cake so there we met Lele , the very best gondolier who took us among the beautiful Venetian palaces situated behind Doge’s Palace. 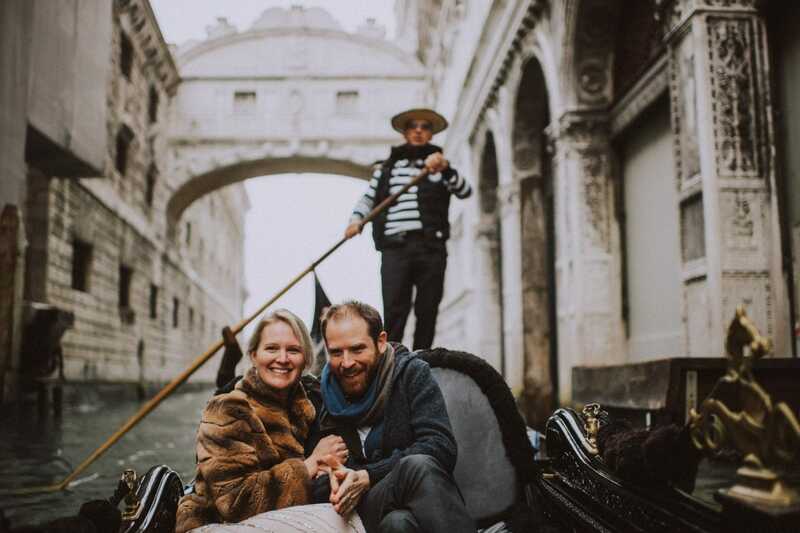 The tour ended passing under the Bridge of Sighs. 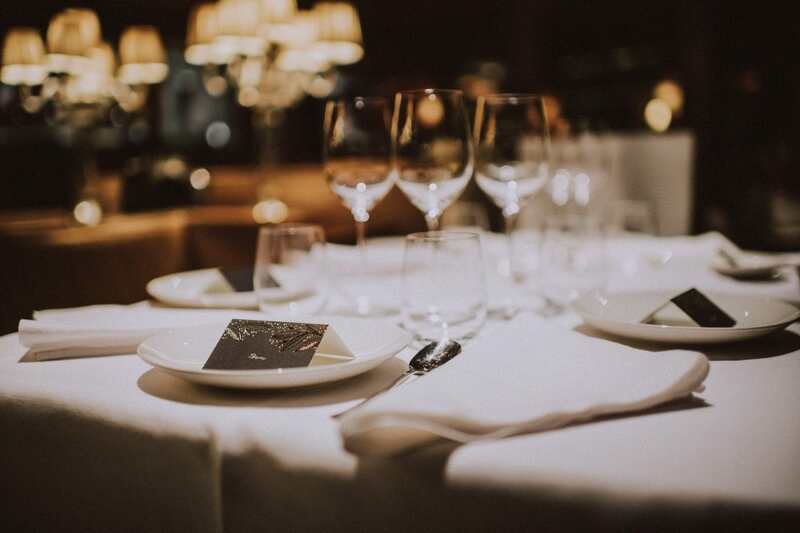 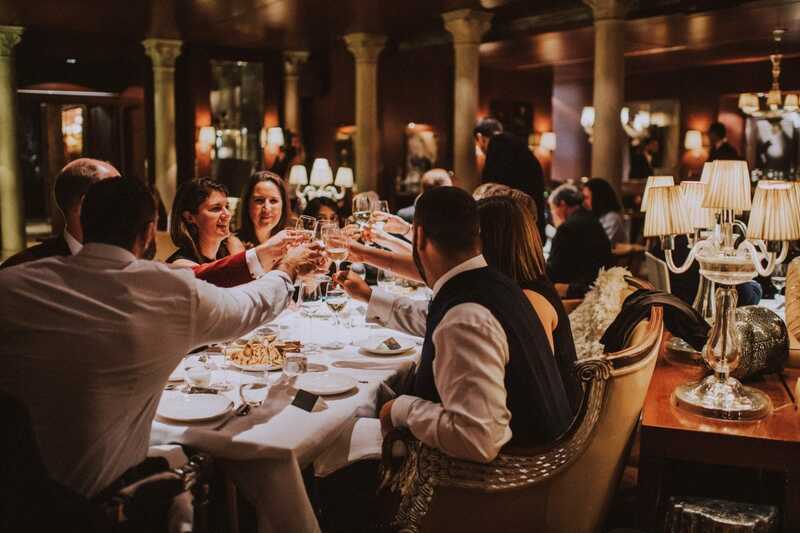 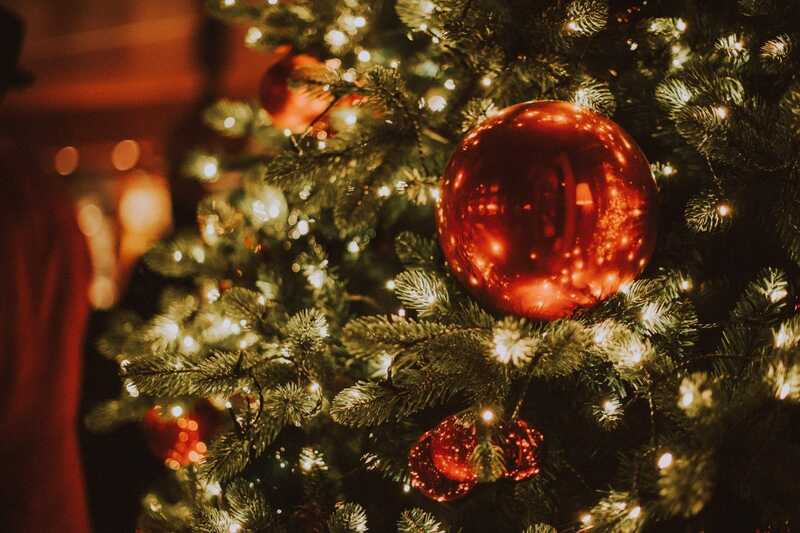 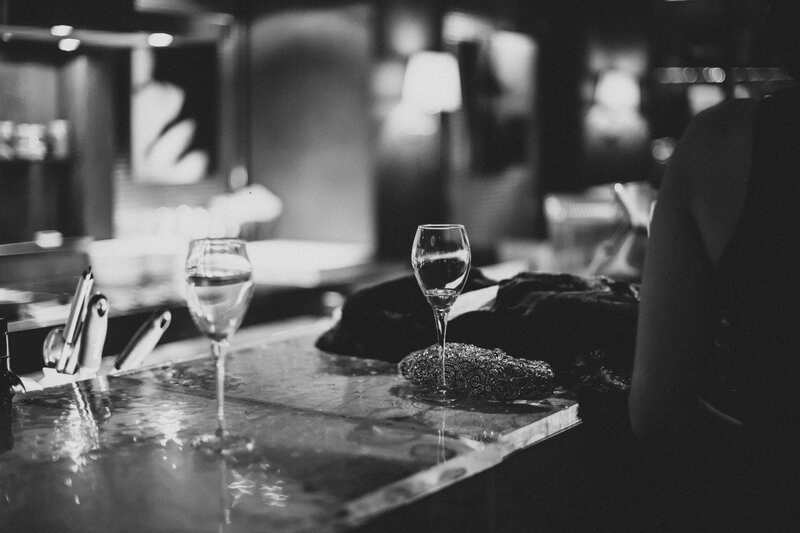 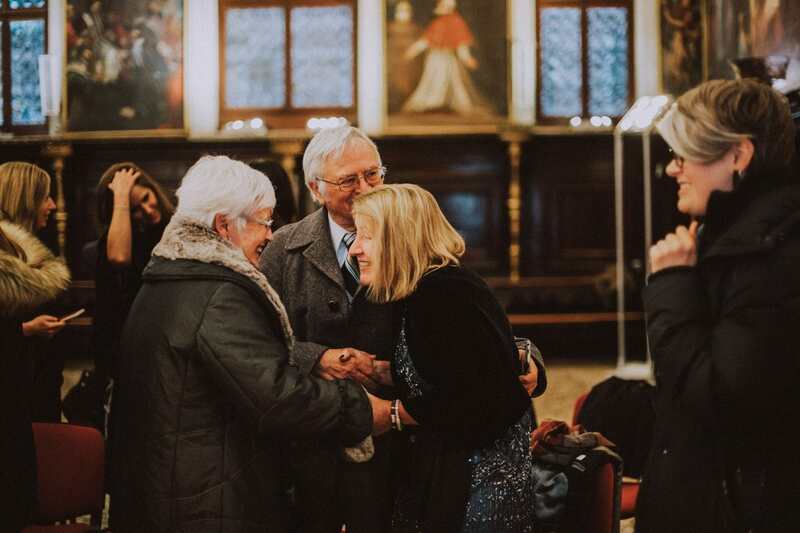 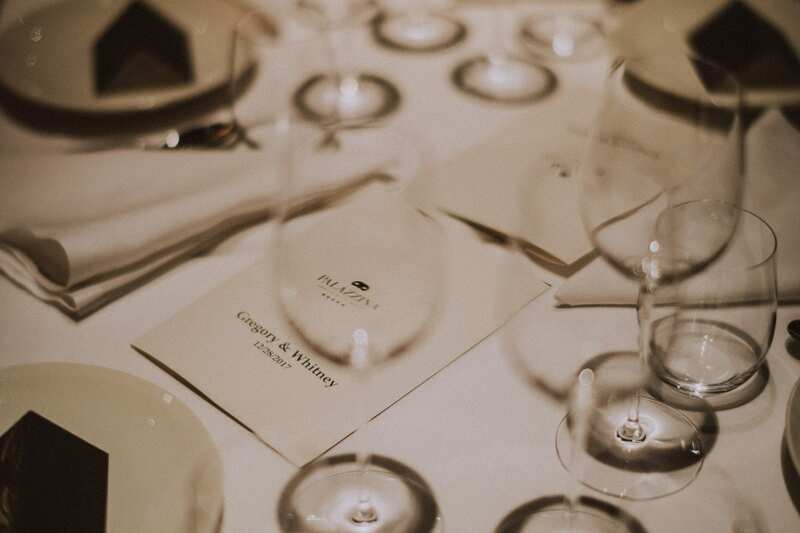 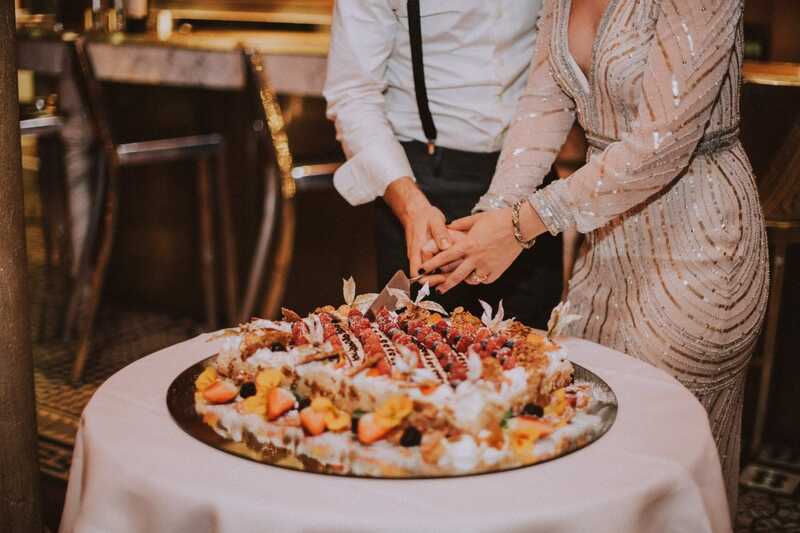 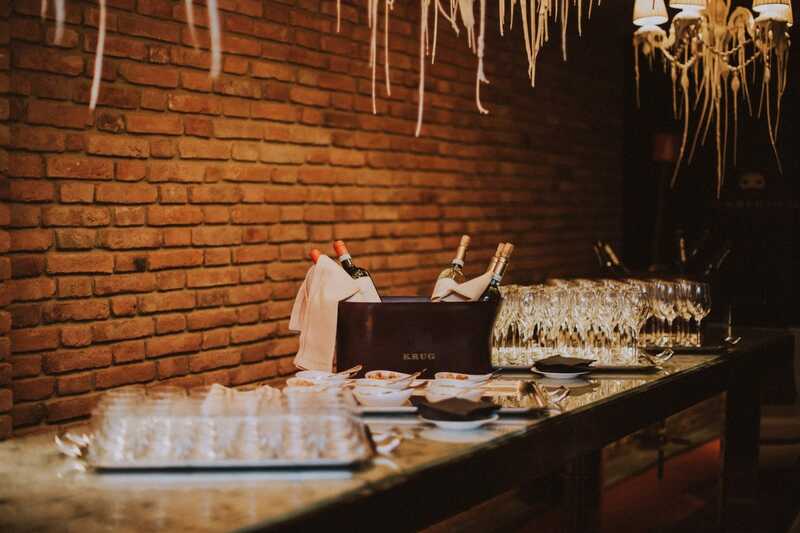 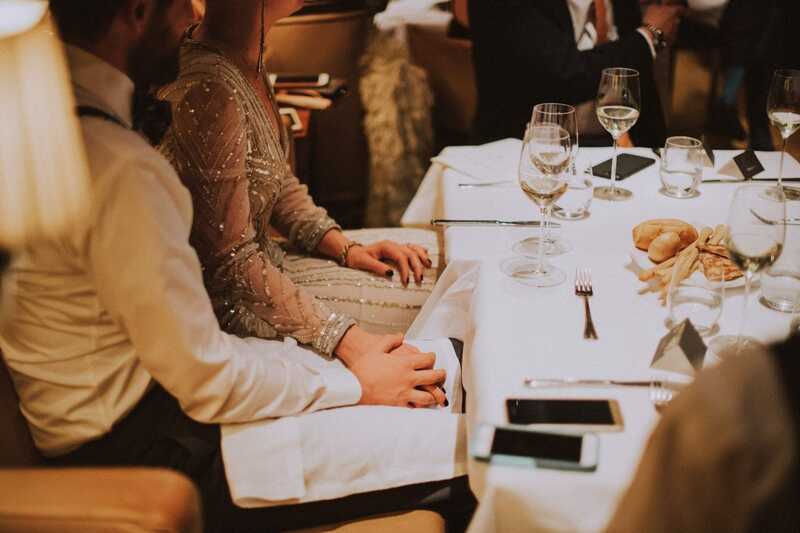 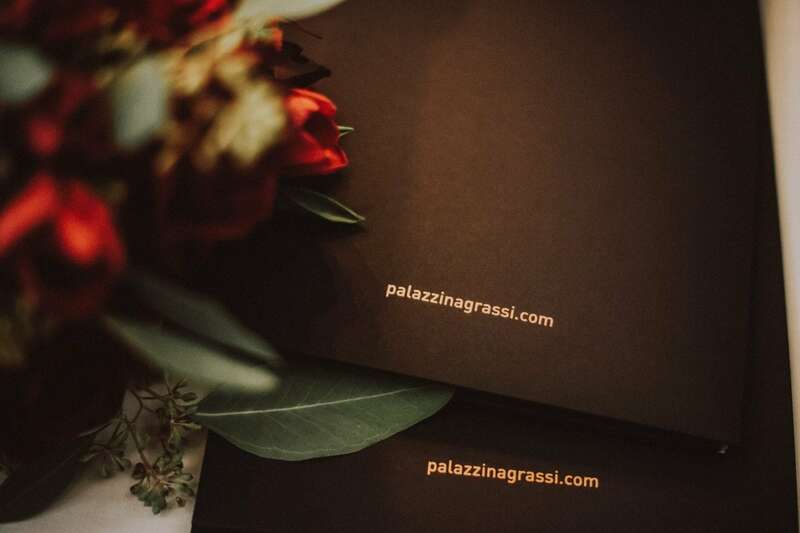 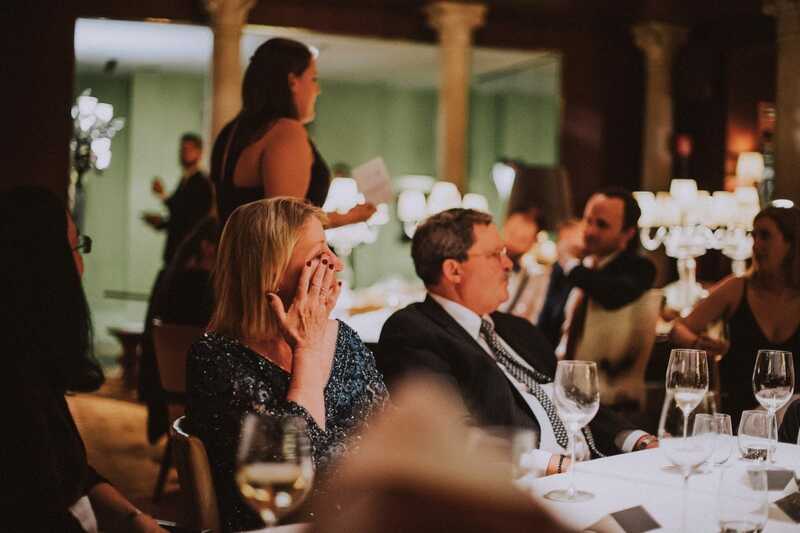 Once back at Palazzina G, the couple met their families and friends. 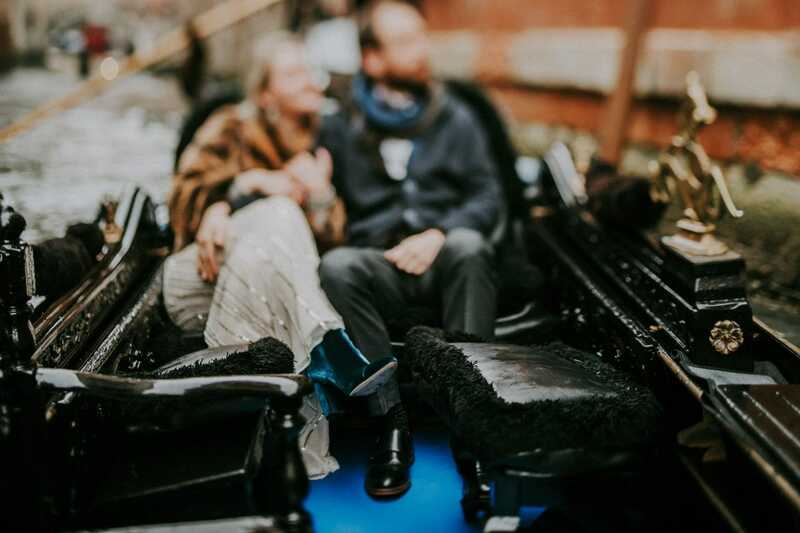 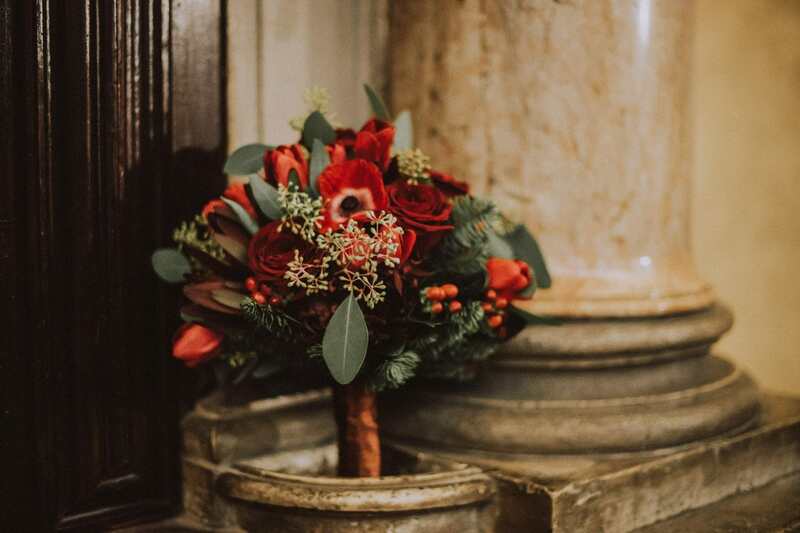 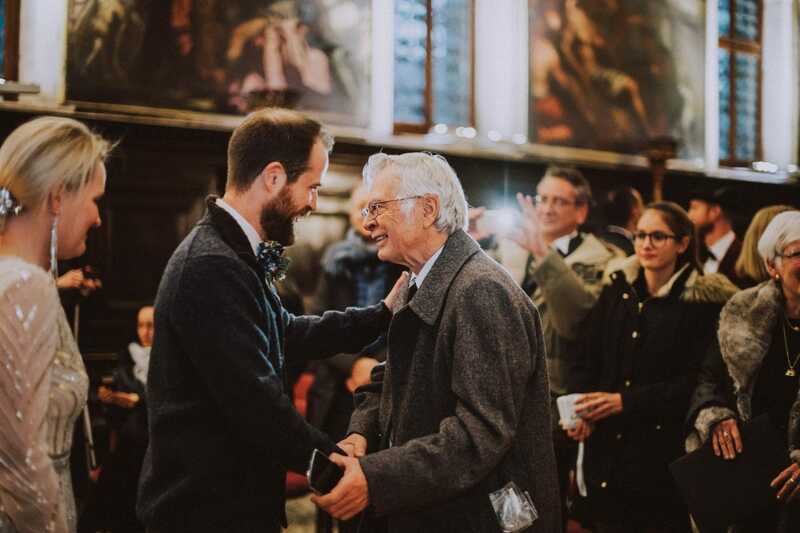 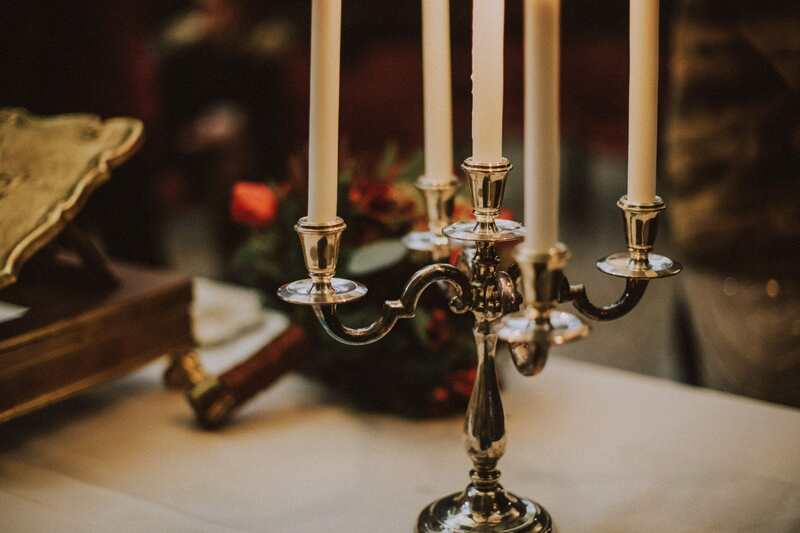 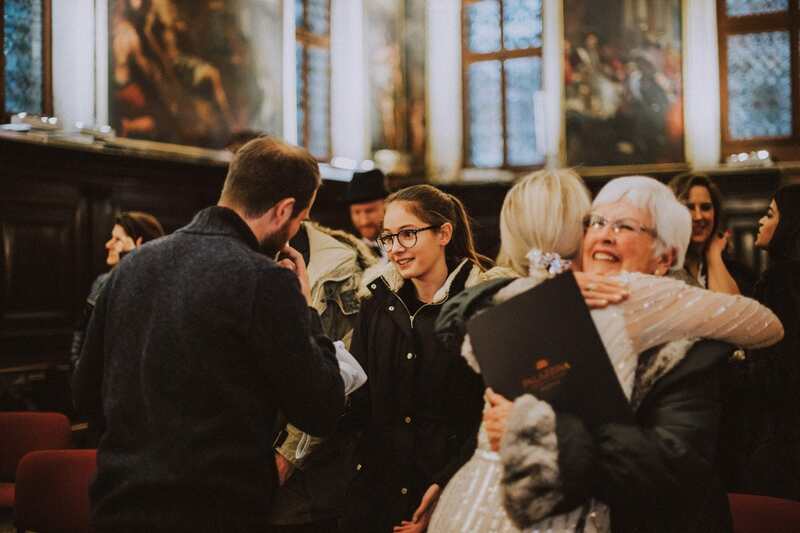 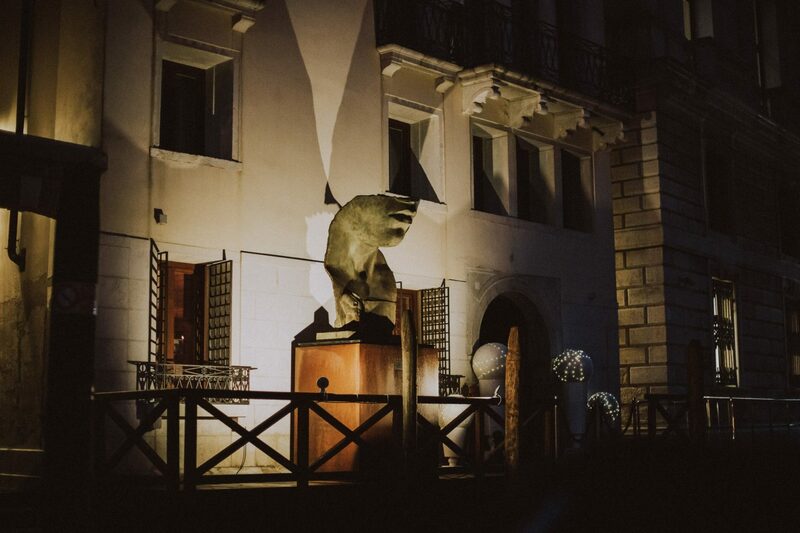 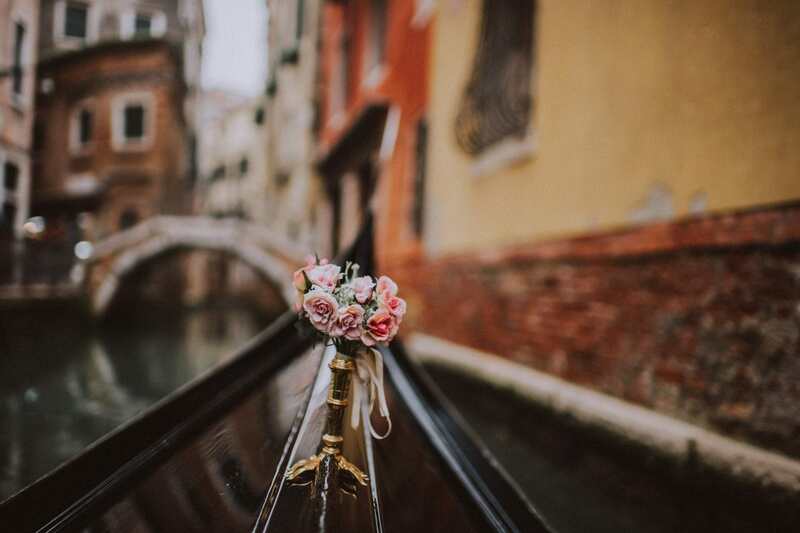 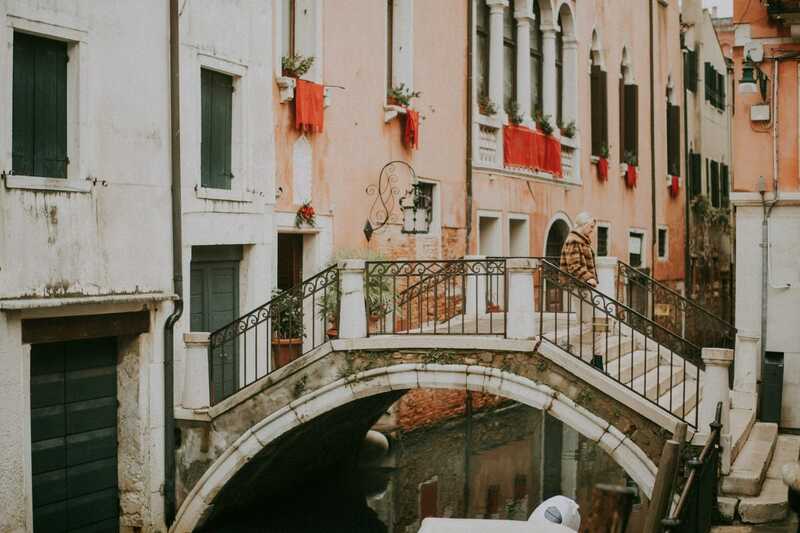 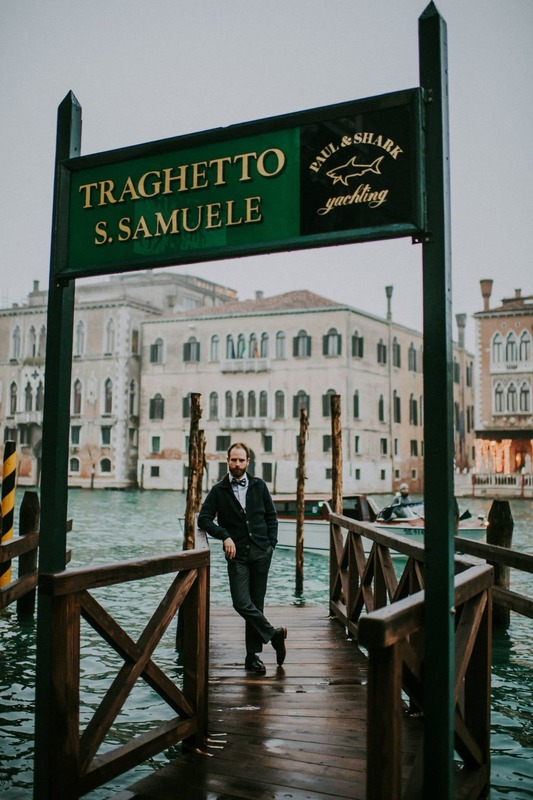 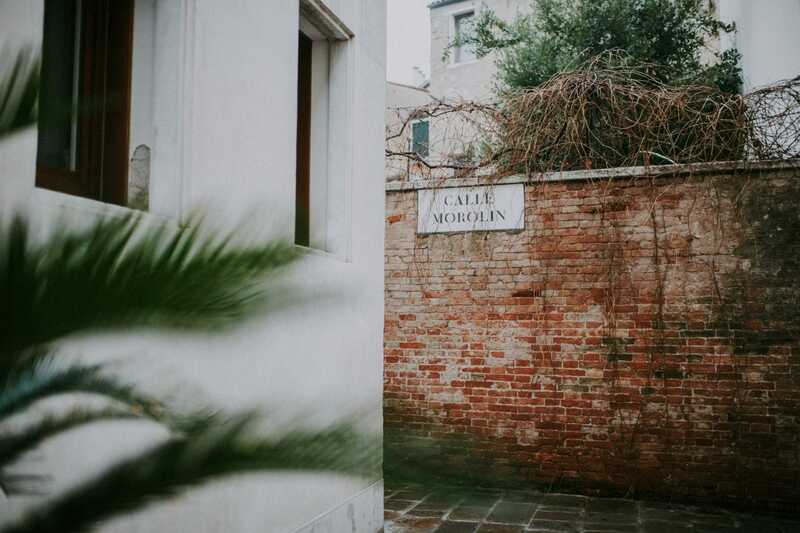 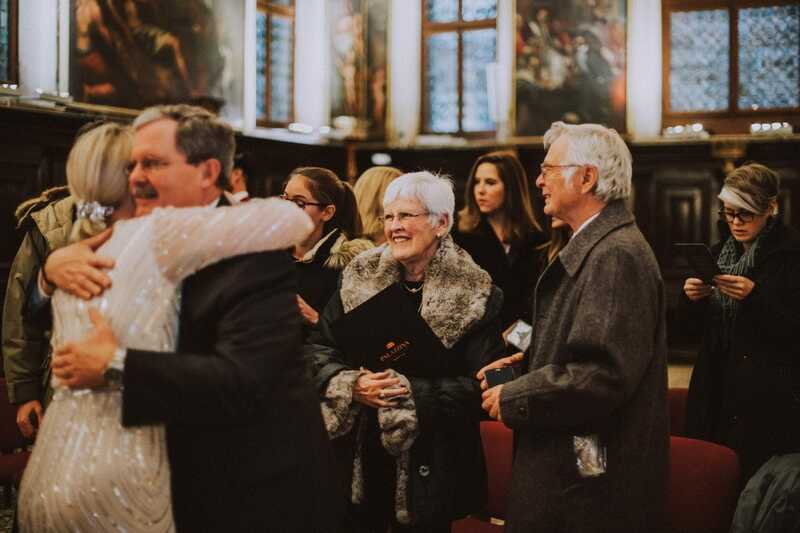 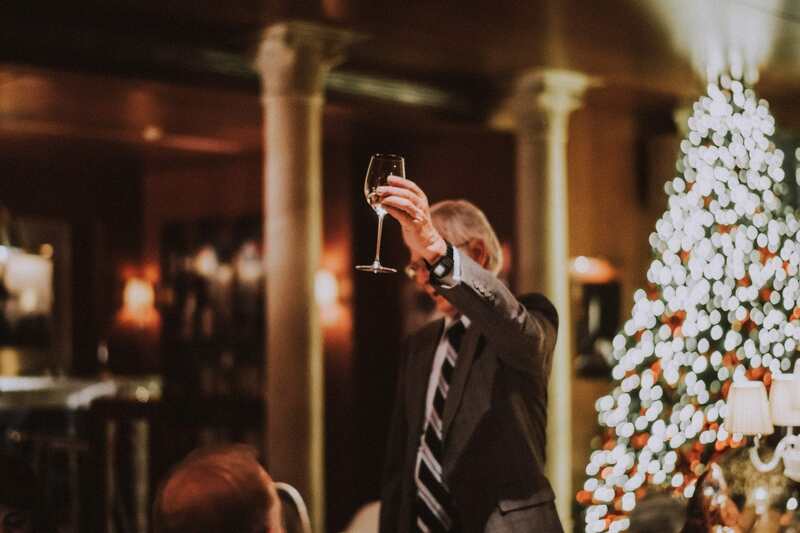 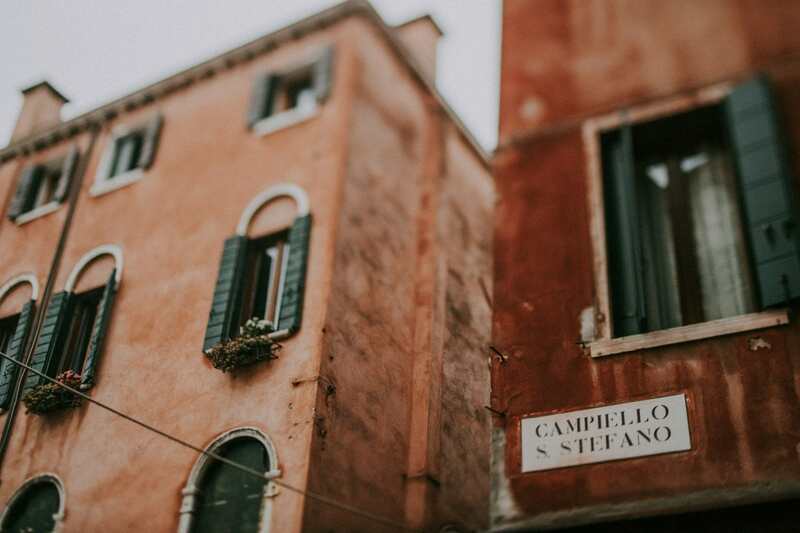 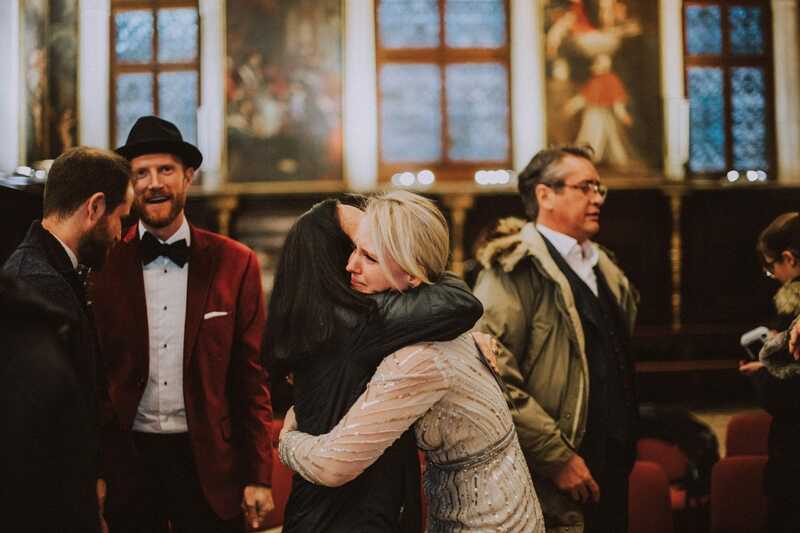 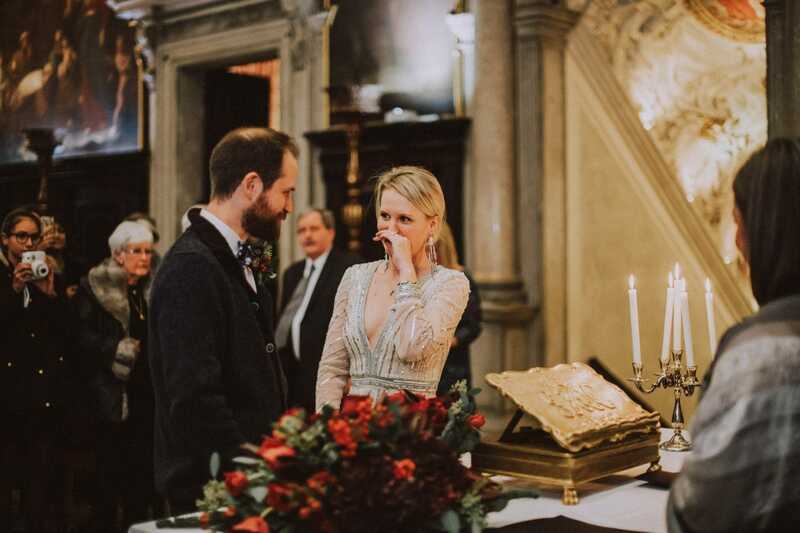 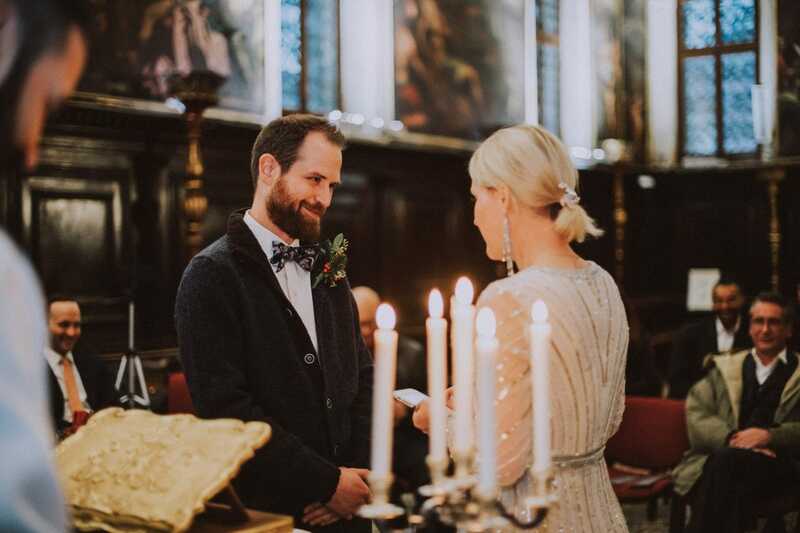 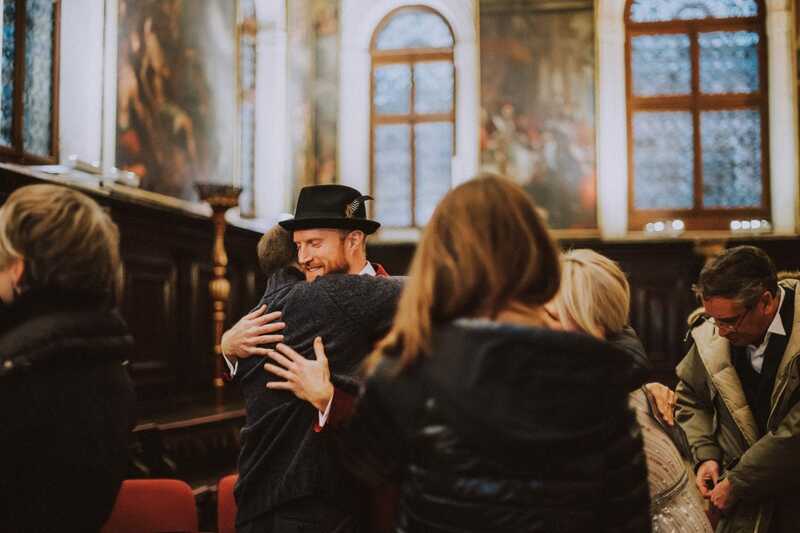 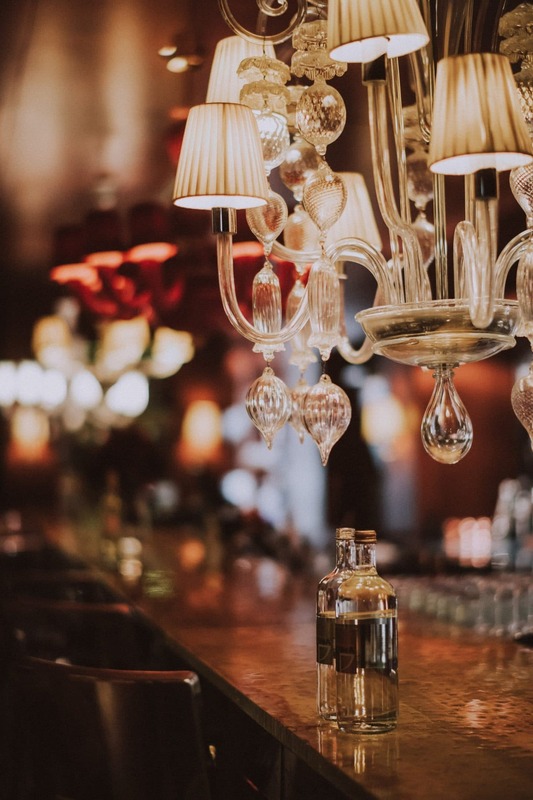 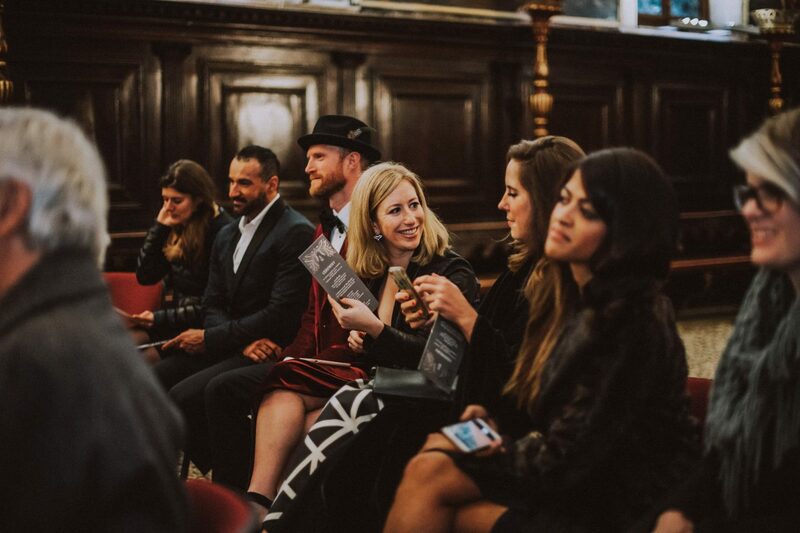 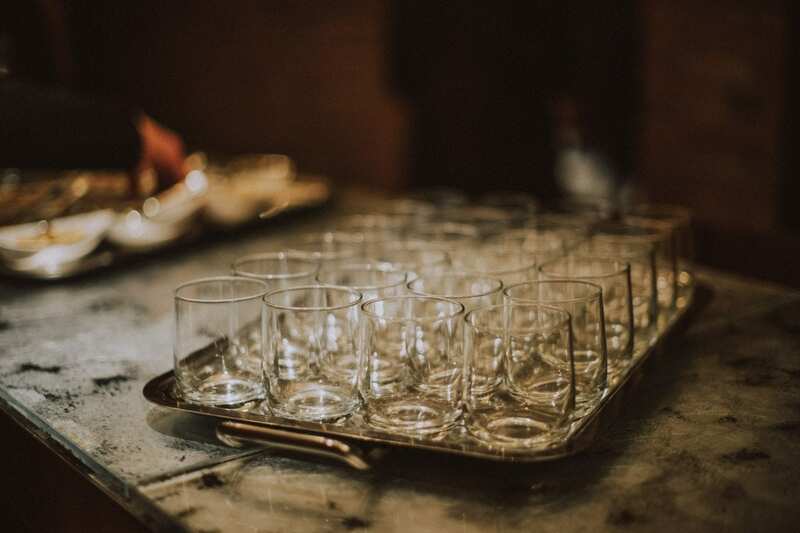 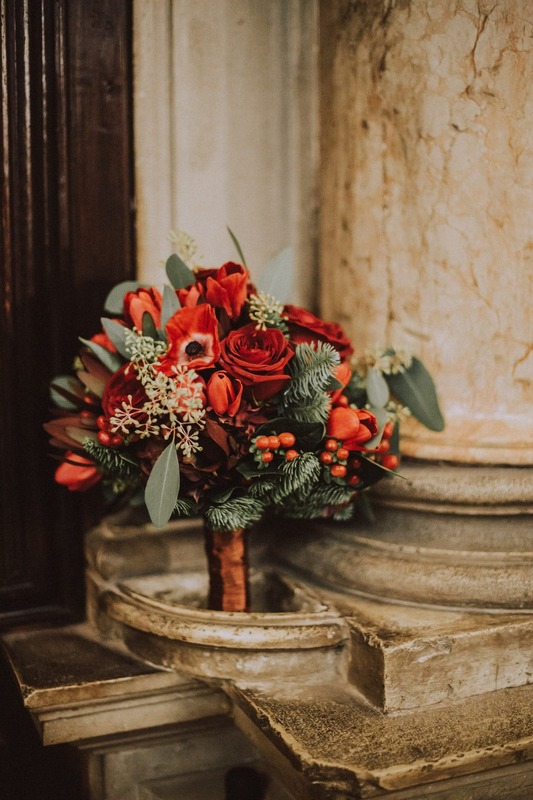 As mentioned many times before, the well known Scuola Grande dei Carmini is one of the most attractive ceremony venues for destination weddings and elopements in Venice. 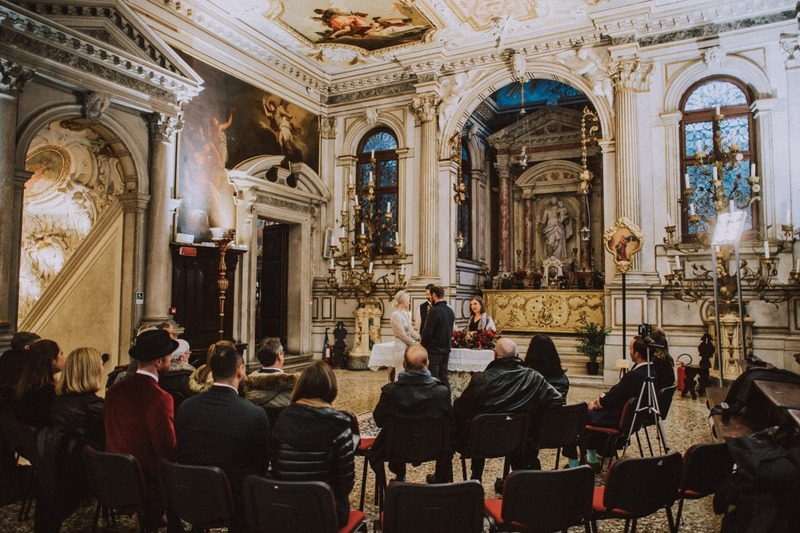 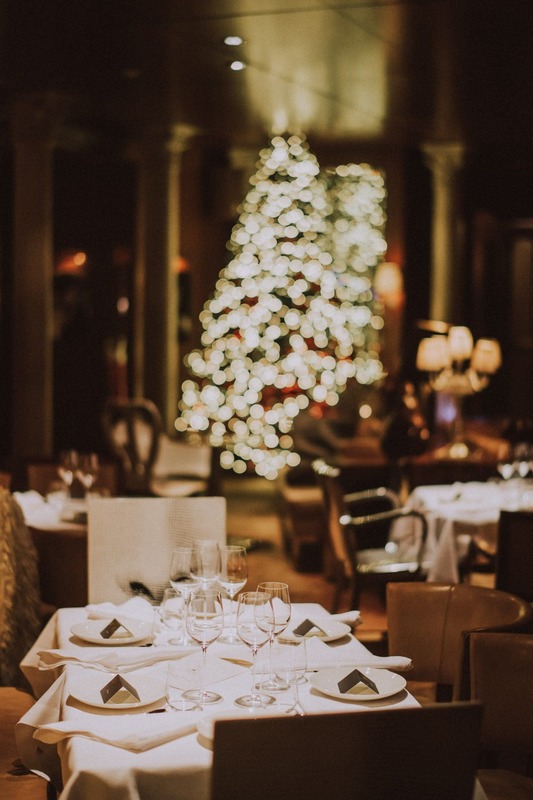 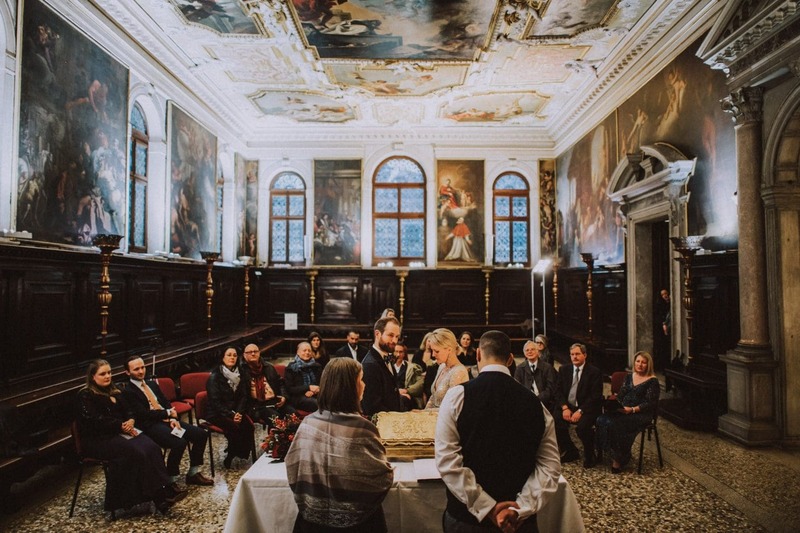 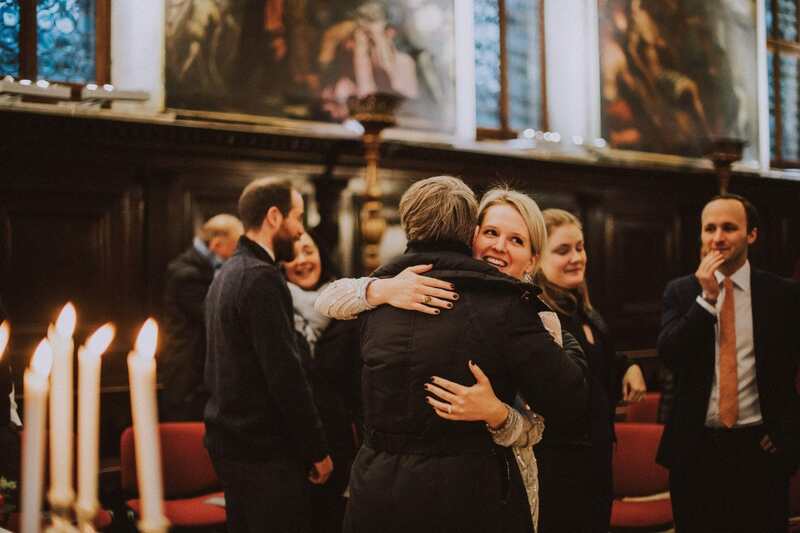 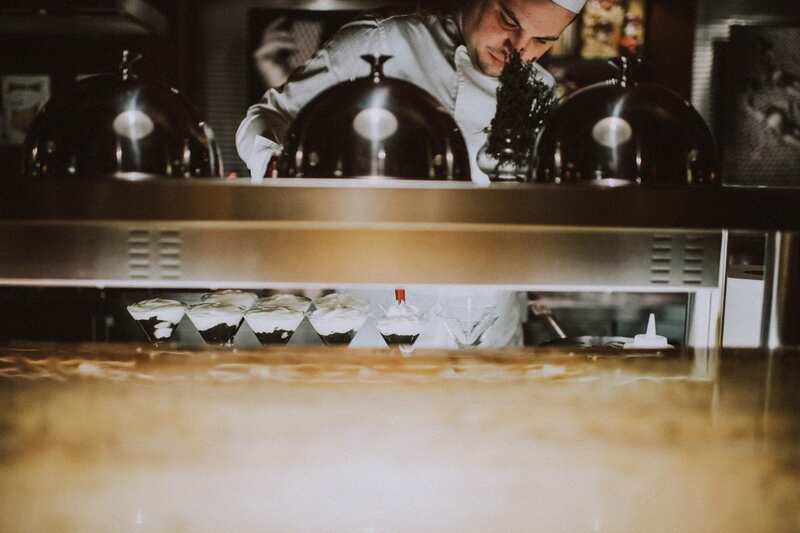 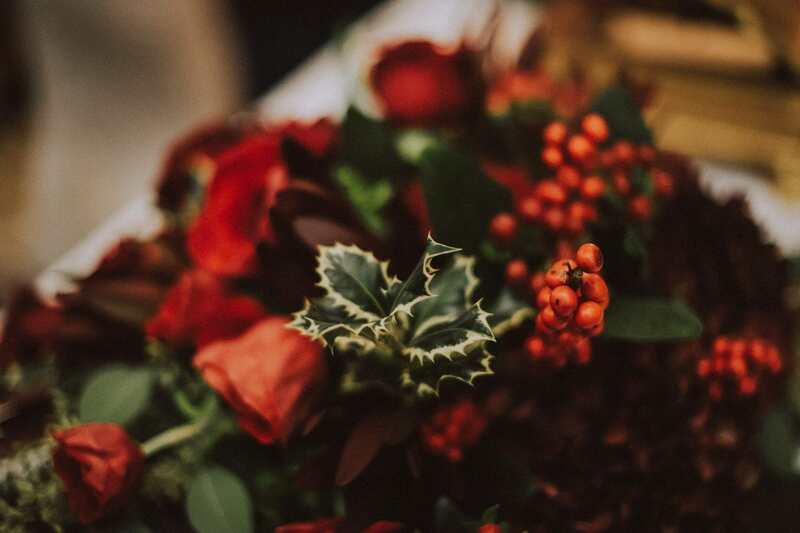 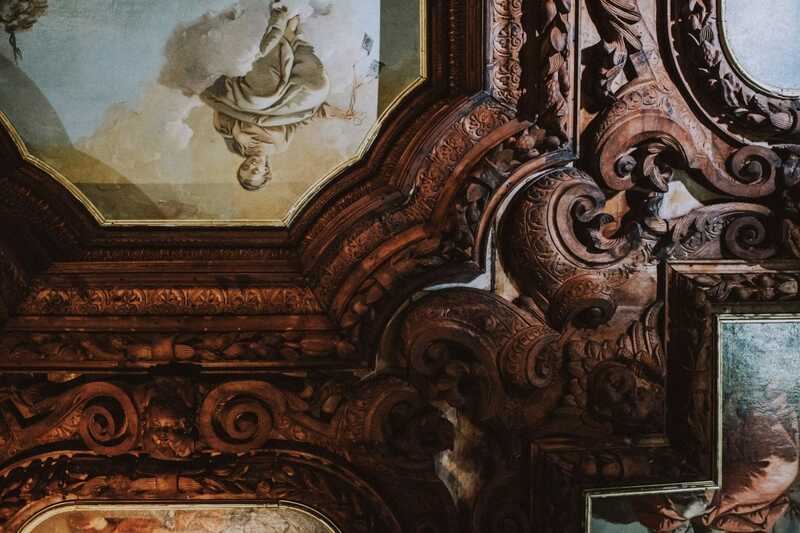 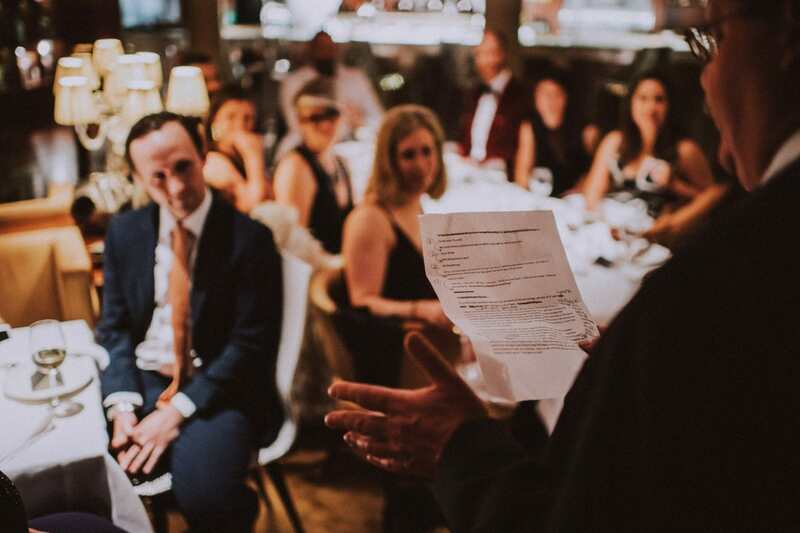 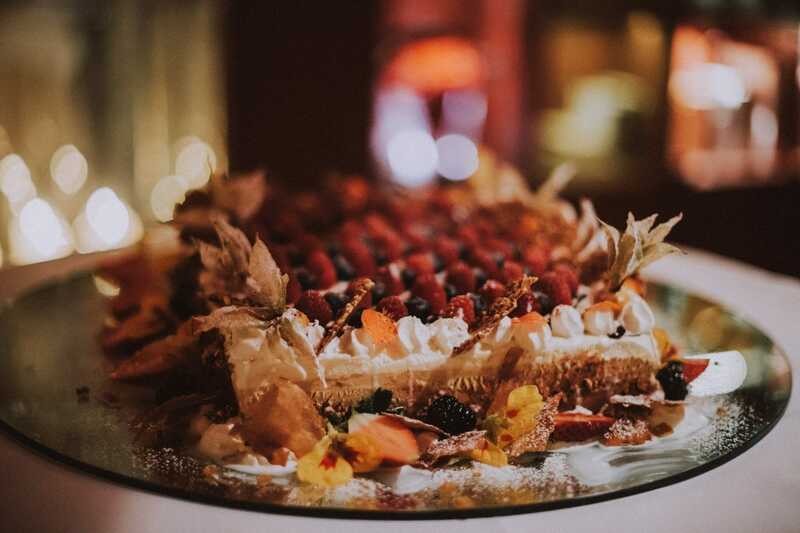 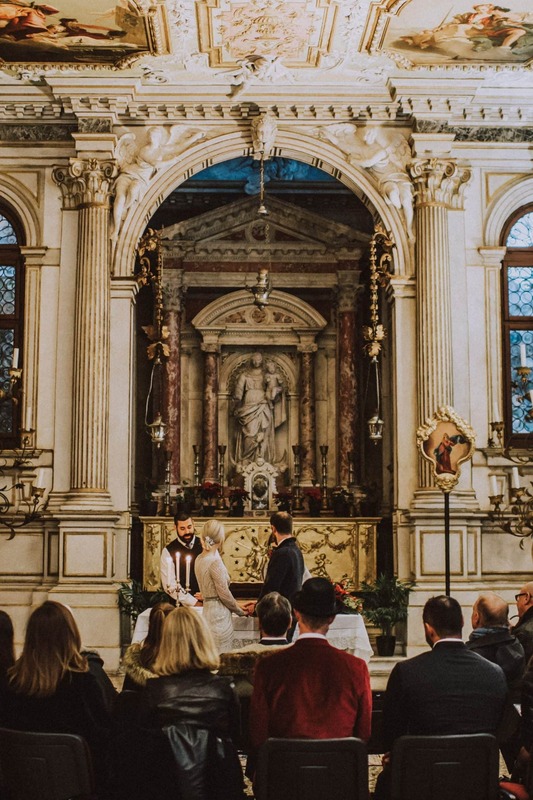 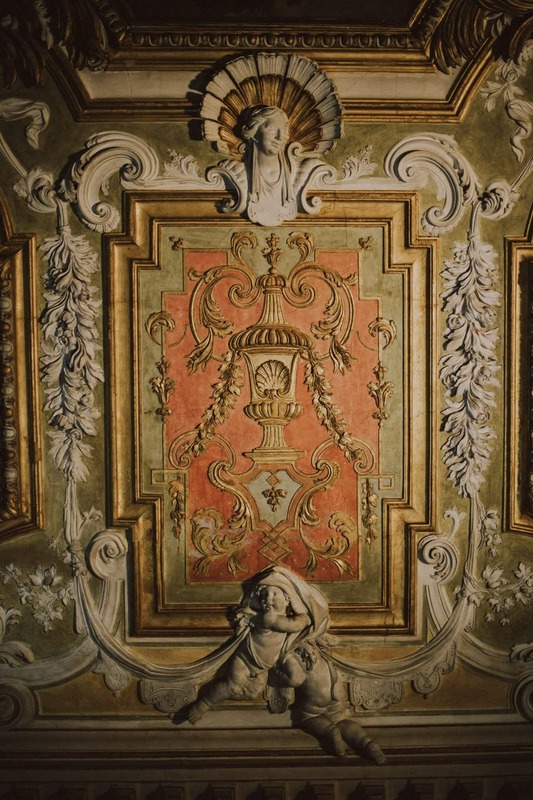 Its ancient frescoes painted by Giambattista Tiepolo, a famous Venetian painter, make this old oratory among the top three favorite venues chosen to tie the knot. 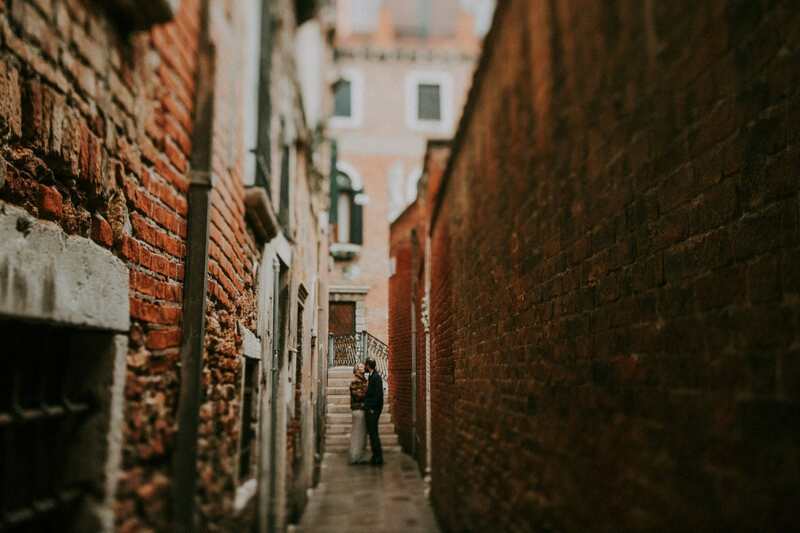 And this is where their intimate ceremony has been held. 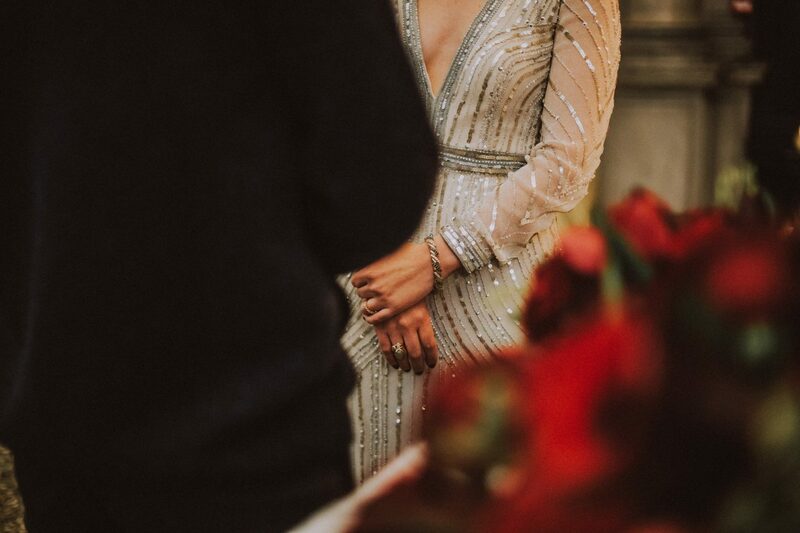 There are a lot of reasons why I love my job. 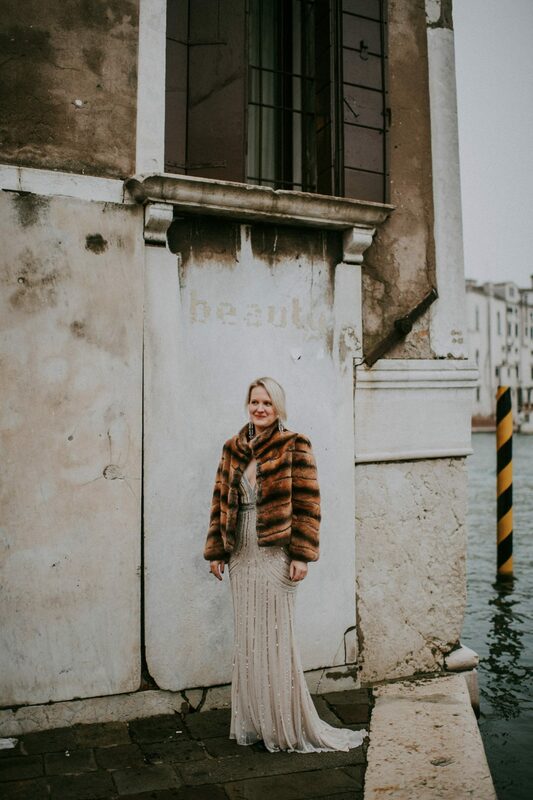 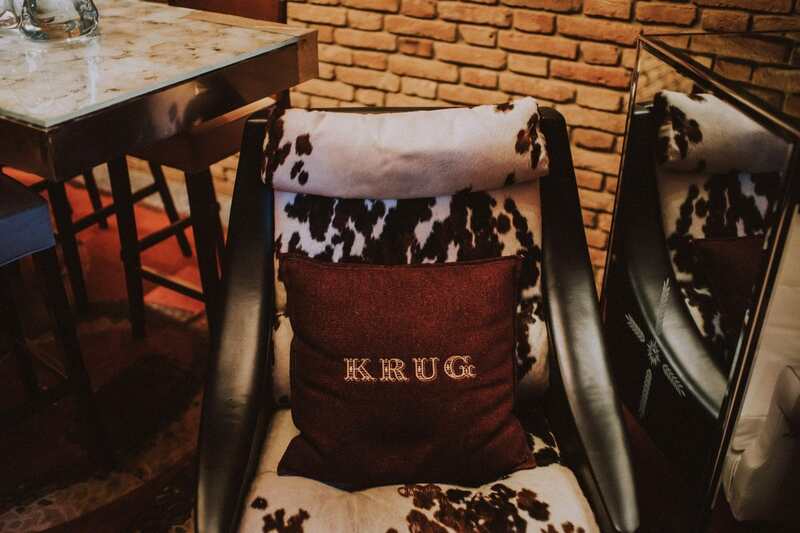 A few are, I get to meet new people and build connections, I get to work with some incredible vendors and I am able to tap into my creative side daily! 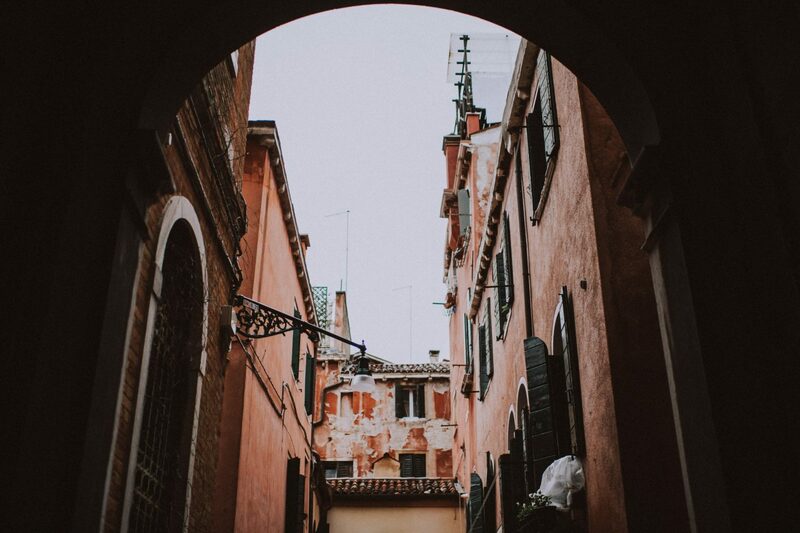 But one of the many perks is being able to visit some magical places. 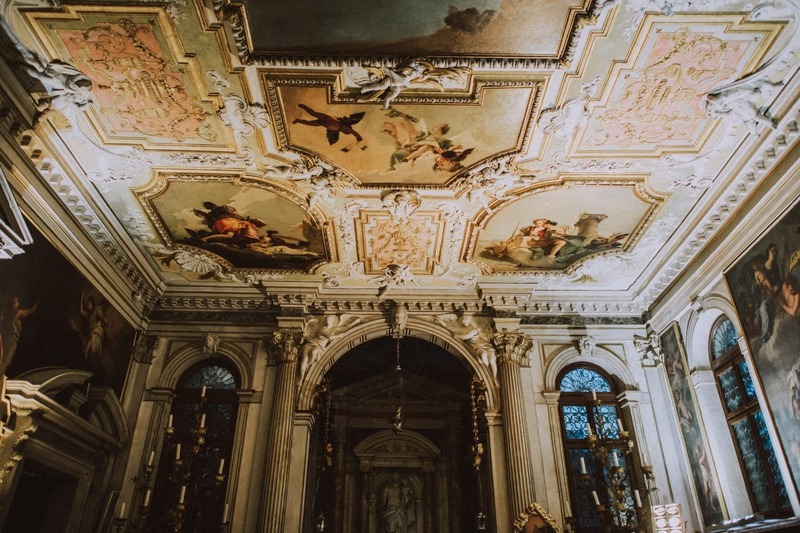 Scuola Grande dei Carmini is absolutely one of them!